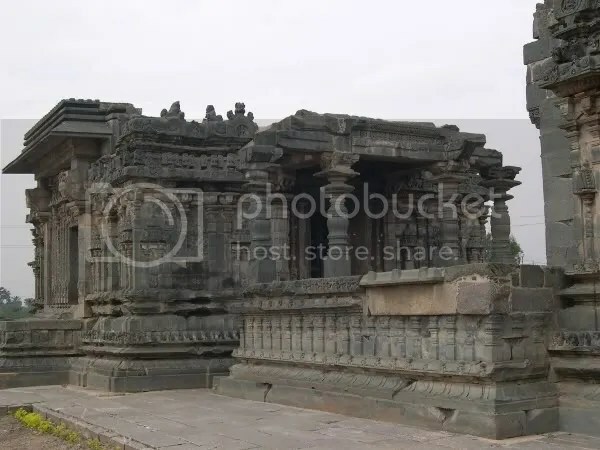 North Karnataka region has many architecturally significant and ancient temples. 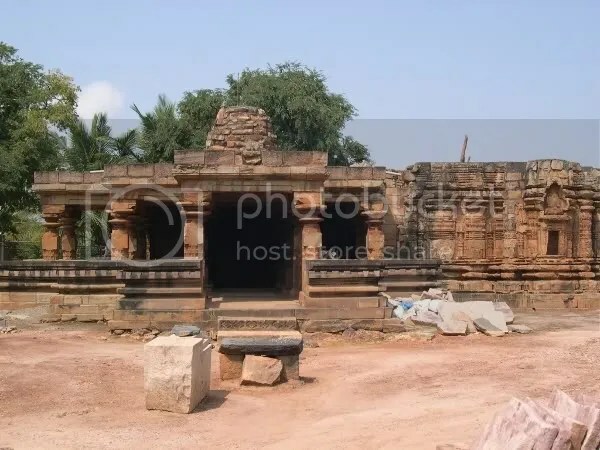 But a typical temple circuit tour to North Karnataka would most probably end at Badami, Aihole and Pattadakal. 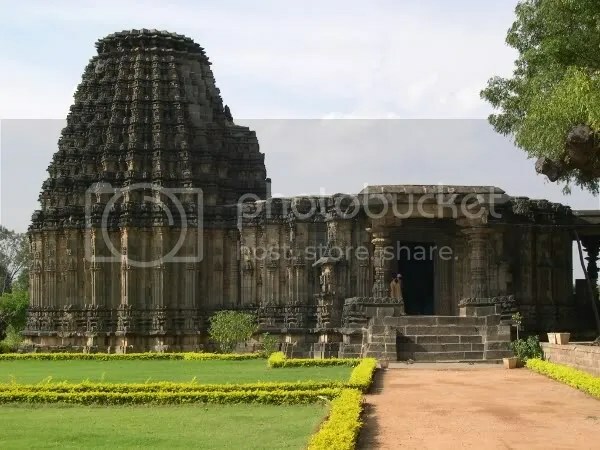 Here are some lesser known and lesser visited but equally beautiful temples of North Karnataka. 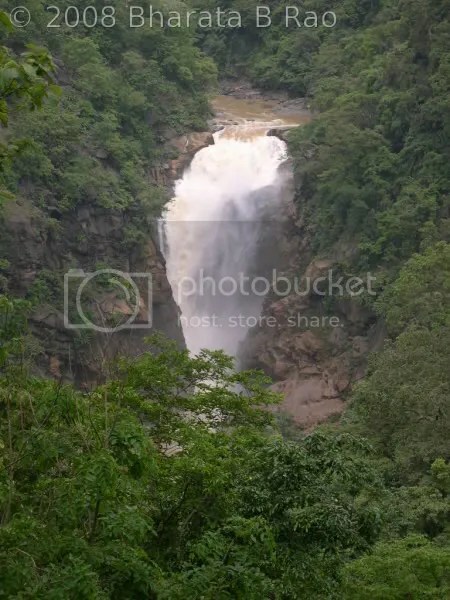 I was at Sirsi during 3rd week of September just before the devastating floods that engulfed North Karnataka region. 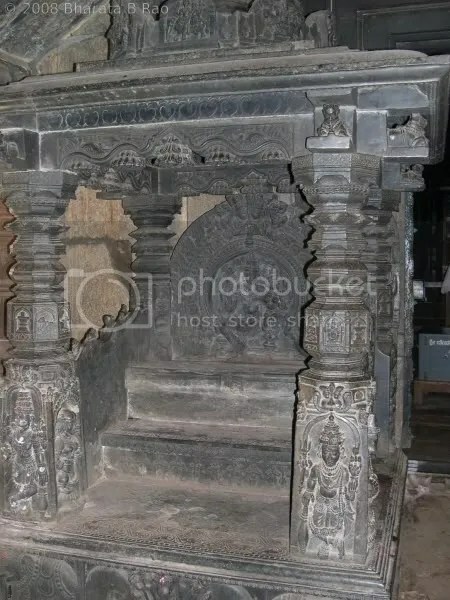 Since I had a day to spare, I decided to checkout some temples in Dharwad and Gadag districts whose details I picked up from Karantaka Tourism’s handouts and later from wikipedia. 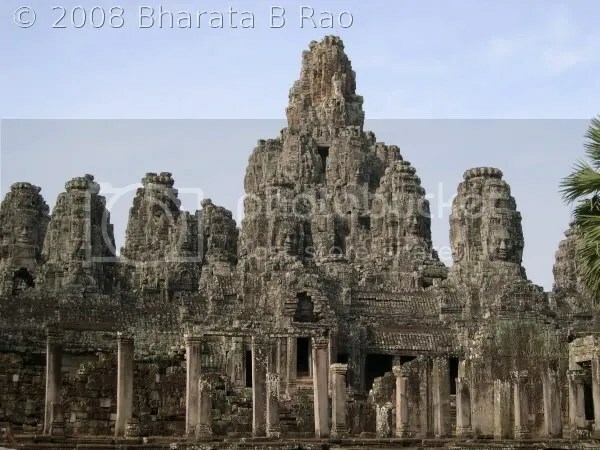 Since the wikipedia links for these temples give more information than what I could potentially provide, I am mostly skipping the descriptions of the temples themselves and would only indicate how to reach the place with a few photographs of each of the temples. This is the list of temples that I covered in the order I visited. 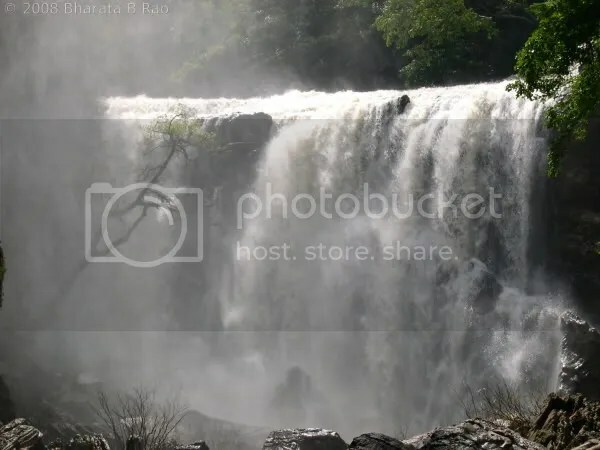 Unkal is located at a distance of around 5km from Hubli town on Hubli-Dharwad road (SH73) towards Dharwad and is close to Unkal circle and Unkal lake. The approach to the temple is horrible and you begin to wonder if you are in the right place when you have to navigate through dirty roads of a slum locality (well almost a slum). 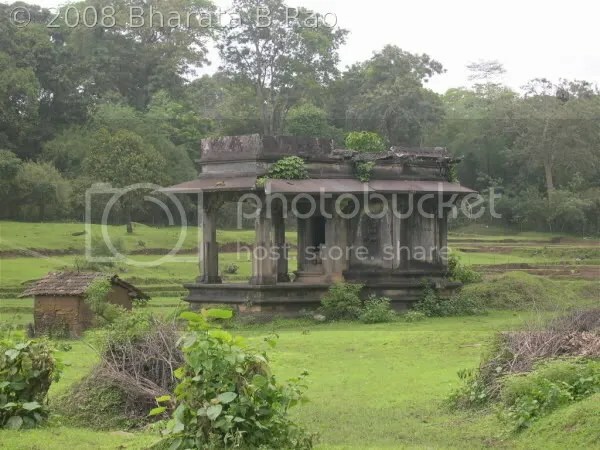 But suddenly a well maintained temple becomes visible and appears as a total misfit in the area. ASI has a pretty good job of maintaining the monument in whatever space they could get around the temple. 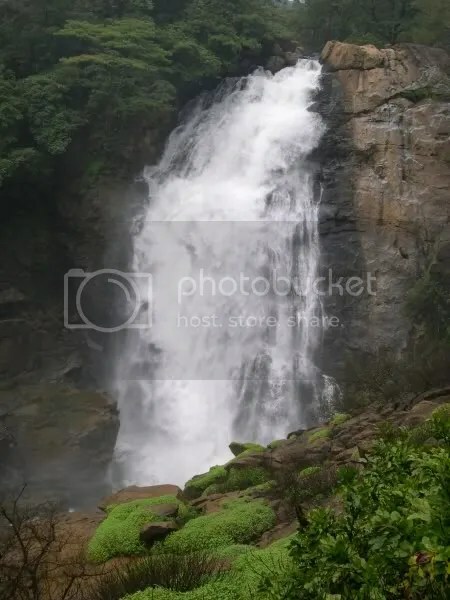 Amargol is located at around 5km from Unkal towards Dharwad on SH73. 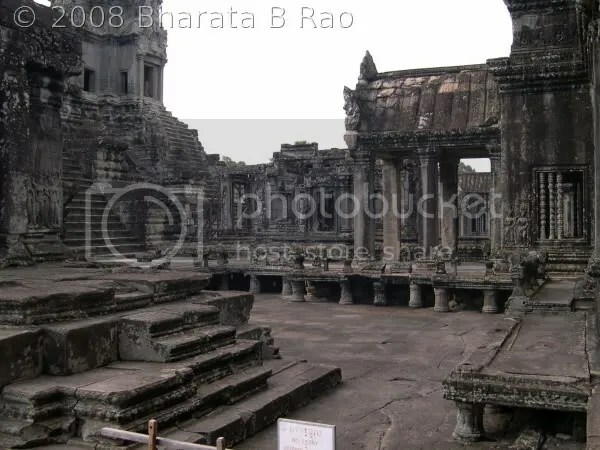 Similar to Unkal, the temple here is also located in not so good surroundings. 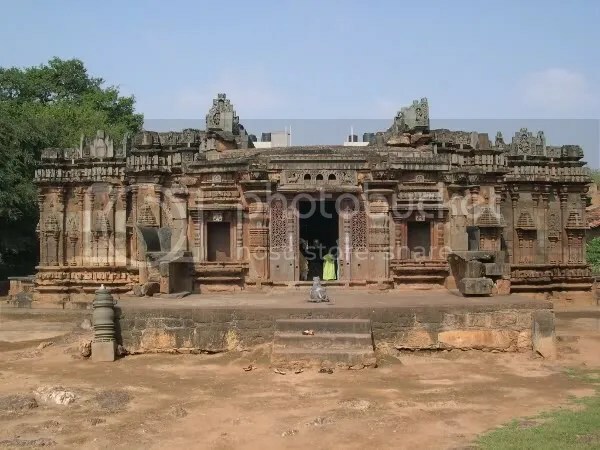 It took some effort to Locate the temples of Unkal and Amargol as many locals whom we enquired hardly knew about these temples. Annigeri is situated at on NH63 at a distance of around 35km from Hubli towards Gadag. The main temple dedicated to Amruteshwara is very beautiful. 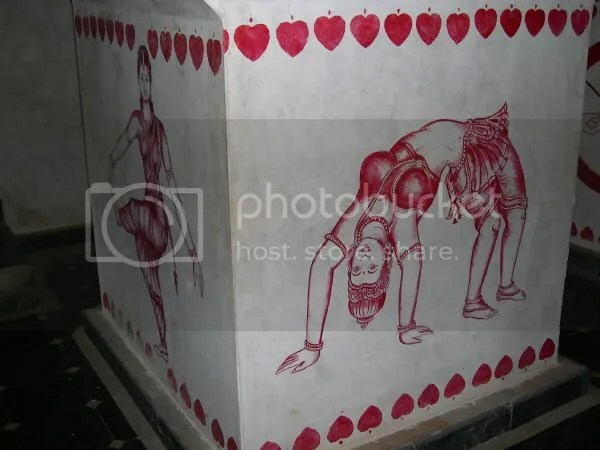 I didn’t have time to checkout other temples in this town (Banashankari, Basappa, Gajina Basappa and Hire Hanuman) which are probably not architecturally significant. 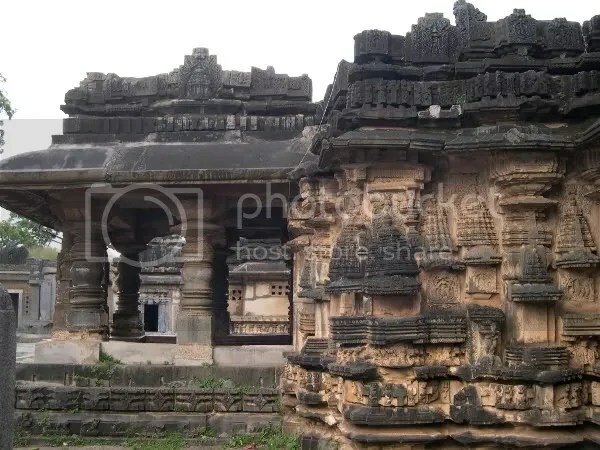 Gadag is situated at around 57km from Hubli on NH63. The Kashi Vishweshwara and Surya Narayana temples face each other. The entrance to these temples have very delicate decorations. 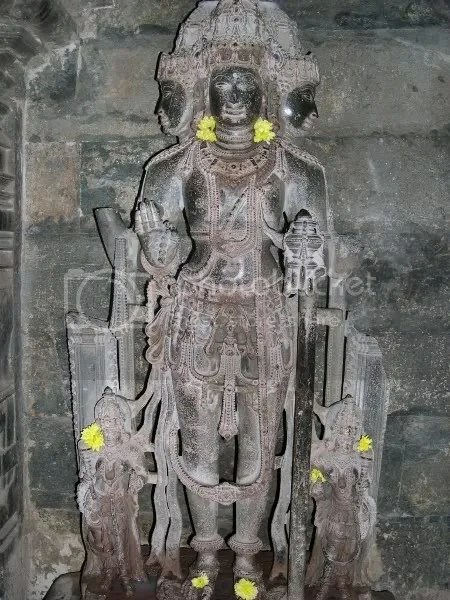 Adjancent to Kashi Vishweshwara temple is present the Naneeshwara temple. A couple of hundred meters from Naneeshwara temple, a museum and a Jain Basadi are present. 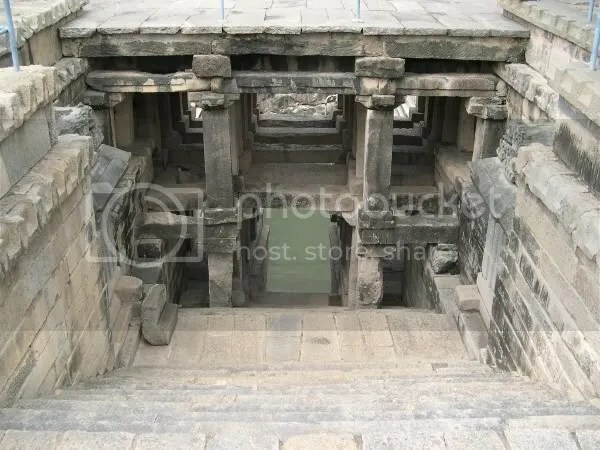 On the other side of the highway, Manikeshwara temple is present with an elaborate and stepped Kalyani (pond). 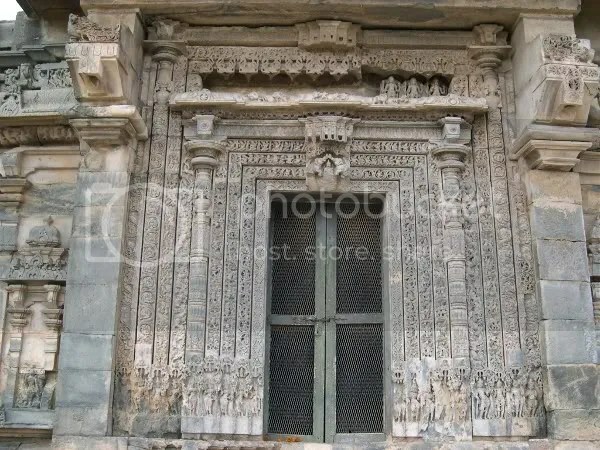 In my limited exposure to temples of Karnataka, I would consider this as a unique Kalyani for this style. 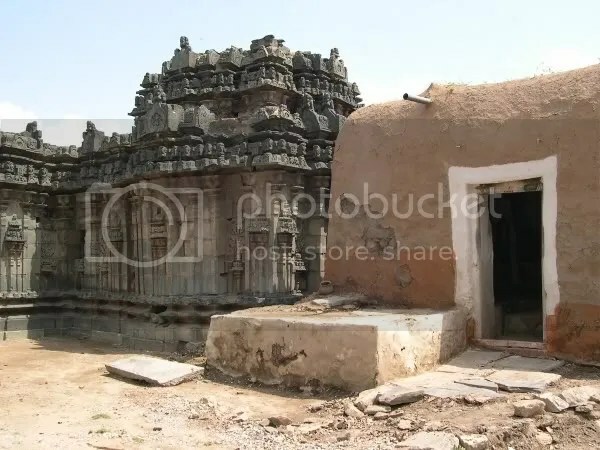 If you have reached Lakkundi, you will repent if you return without a visit to the Dodda Basappa temple of Dambala. 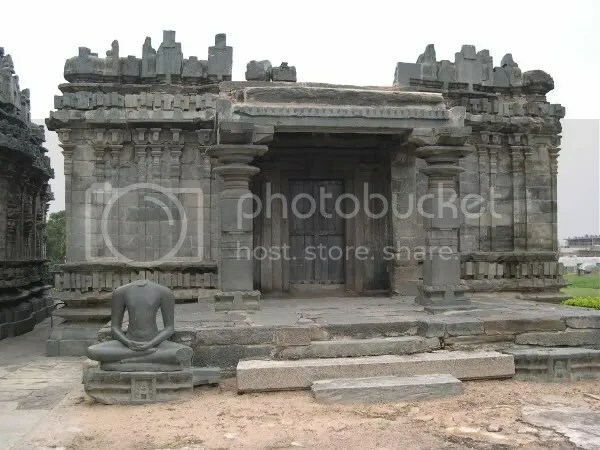 Dambala is situated at around 10km from Lakkundi. The village road from Lakkundi to Dambala was in a decent condition (well almost decent) during my visit. 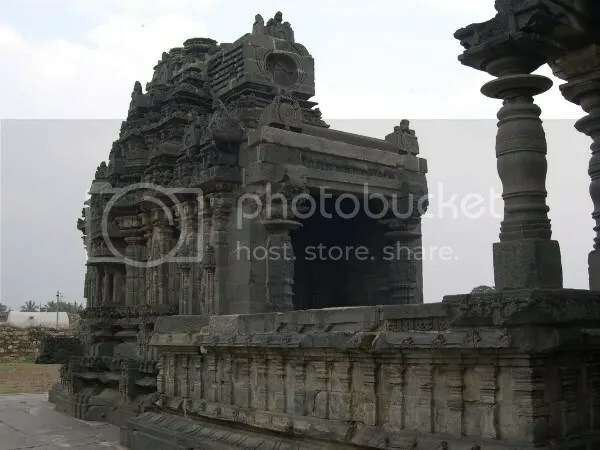 The Gopuram of Dodda Basappa temple is simply majestic. The exterior decorations of the temple are also very good. 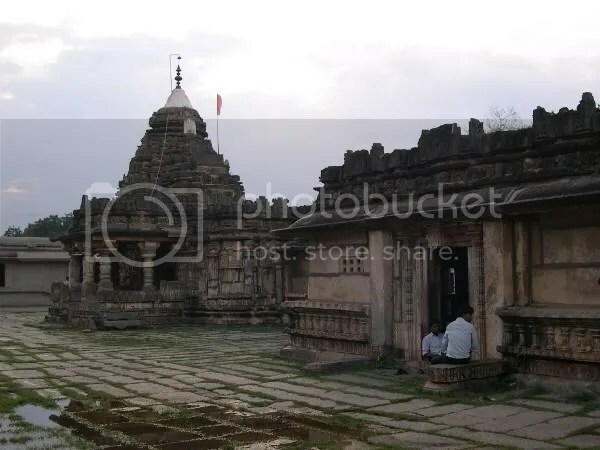 The temple houses a Shiva Linga at one corner and a fairly big Nandi (Basappa) idol at the other end. The platform hosting the Basappa was under rennovation during my visit. 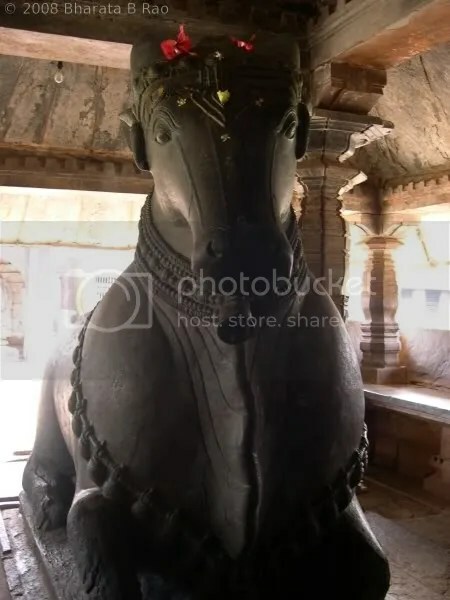 It is interesting that this temple is not known as some Ishwara temple, but is known by its Nandi (Basappa). 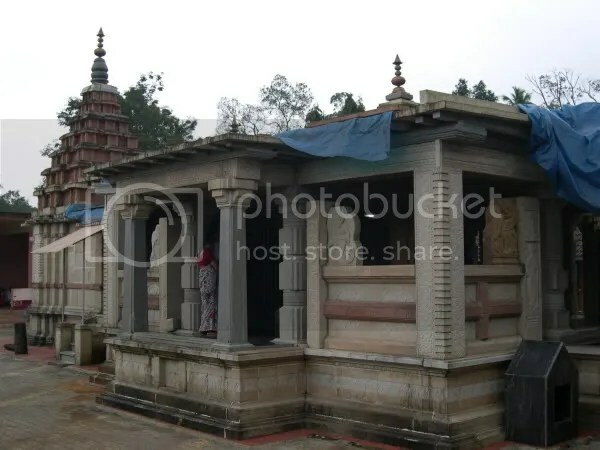 There is a small Someshwara temple just opposite to Dodda Basappa temple. 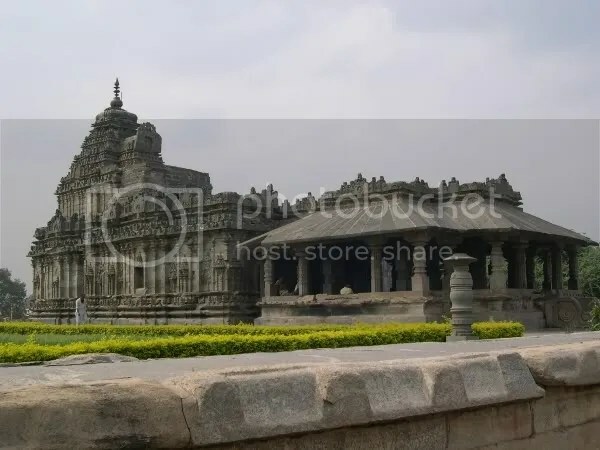 If you are in Dambala, you have two options: either go back to Gadag/Hubli via Lakkundi or proceed further to visit the temples of Lakshmeshwar and Kundgola and rejoin Hubli. One would need a bit of motivation to choose the latter option given the typical hot climate of North Karnataka and the poorly maintained roads connecting these places. I took the village road from Dambala to Shirhatti (can’t remember the exact distance, must be around 35km) and joined SH6 at Magdi (8km) and reached Lakshmeshwar (13km). Apparantely, Lakshmeshwar is directly connected to Gadag by SH6. 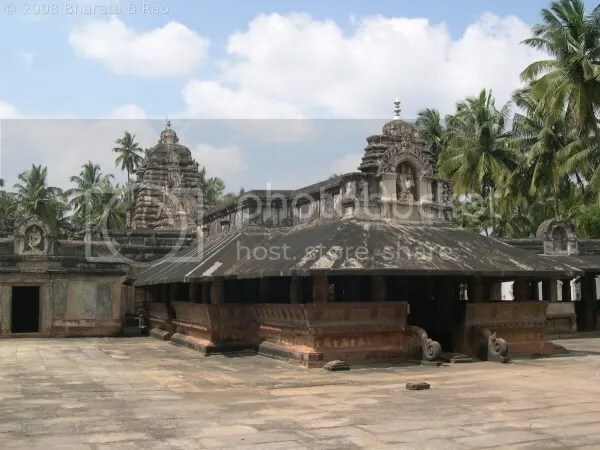 The Someshwara Temple at Lakshmeshwar is a fairly big and beautiful temple where daily worship is still performed. It took me 2hrs to cover a distance of around 50km from Lakshmeshwar to reach Hubli. These (Dambala to Hubli via Lakshmeshwar) are some of the worst roads I have driven on and they can hardly be called roads. Since it was dark by the time I crossed Kundgol, I couldn’t visit the Shambulinga temple. I knew that Cambodia has many Hindu temples dating back to thousands of years, but it was not until I got an opportunity to visit Bangkok that I made a serious attempt to know more about them. As I started reading about them, a wonderful world opened up before me and I felt that I would miss a piece of history if I came back from Bangkok without visiting Cambodia. I was traveling to Bangkok on an official visit with Vatsa and he readily agreed to accompany me to Cambodia as well. There is an overwhelming amount of information about Cambodia on the internet and sometimes too much of information can be a bit confusing when making travel plans. Taranga, a Kannada weekly magazine was running a series of articles on Cambodia. That turned out to be what the doctor had ordered for us. The author had given extensive information about the temples and their architecture. 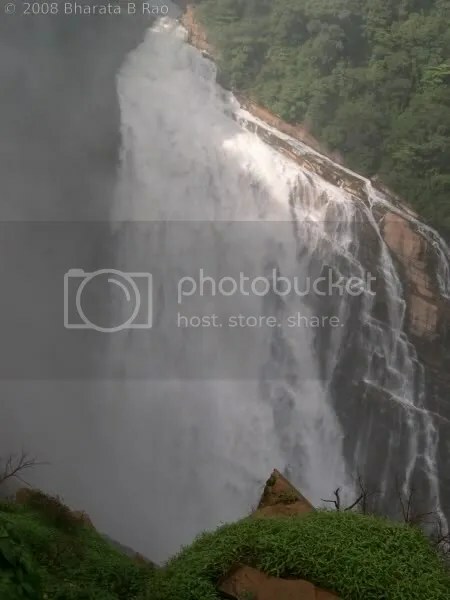 Not only that, he had given a good account of travel as well as the accommodation information. Based on his article, we decided that we would need 3 full days to cover temples of significance around the Siem Reap area of Cambodia. Cambodia provides e-visa and we could pay visa fees (25$) by credit card. I was pleasantly surprised to get visa confirmation within a day. The accommodation was booked online at Palm Village Resort, as per the recommendation from the article. The booking was confirmed without any advance payment and the charges were 39$/day for a double bed room. 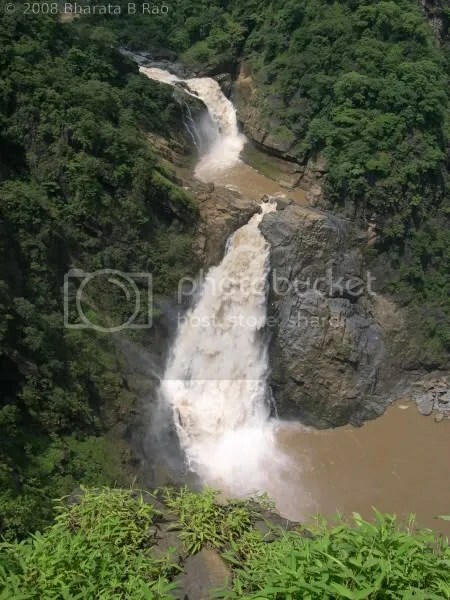 We planned to enter Cambodia though road via the Aranyaprathet – Poi Pet border. With all travel arrangements in place, it was time to make arrangements for food. Vegetarians generally have problems visiting East Asian countries and hence we decided to carry MTR Ready To Eat packaged food in sufficient quantity to serve us both during our 1 week stay in Bangkok and later in Cambodia. Only other concern we had was the weather. We were making this trip during end of June and it’s the beginning of rainy season in Cambodia. We had no choice in this matter as we were clubbing our personal visit to Cambodia with the official visit to Bangkok. We reached Suvarnabhoomi International Airport, Bangkok on early Sunday morning. We had traveled to Bangkok on a single entry tourist visa and we needed to get a re-entry permit as we would be getting back to Bangalore via Bangkok. As per the information we had gathered from the internet, obtaining a re-entry permit was as simple as filling up a form (TM.8) and submitting it at the immigration counter in the Airport. 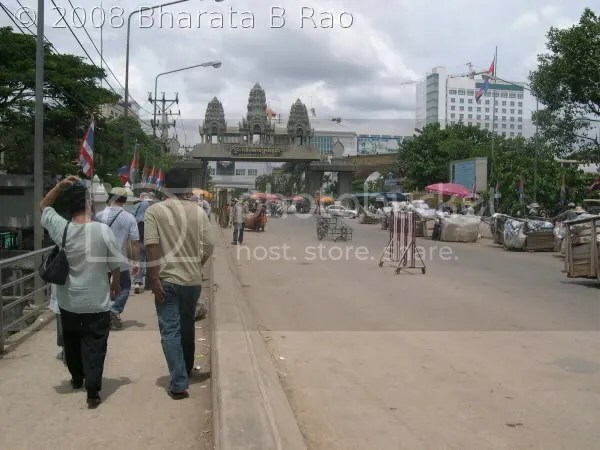 But we realized that this is true for people who are ready to depart to Cambodia by air and road travelers had to apply for re-entry permit by visiting the immigration office in Bangkok. This was a bit unexpected for us and we didn’t have time to visit the Bangkok immigration office in our busy schedule in Bangkok. A couple of agents we contacted refused to forward our re-entry permit applications to the Bangkok immigration office saying that the Office had become very strict with respect to re-entry permits these days and a personal visit was preferred. Another option we had was to get a re-entry stamp when we cross the land border at Aranyaprathet. When contacted over the telephone, the Bangkok immigration office wasn’t able to give us a definitive reply about this possibility. Next couple of days were spent anxiously before we obtained the contact of Aranyaprathet immigration office. The Office clearly told us that it is indeed possible to obtain a re-entry permit while leaving the Thailand border. So we were all set and were eagerly waiting for our official work to get over. 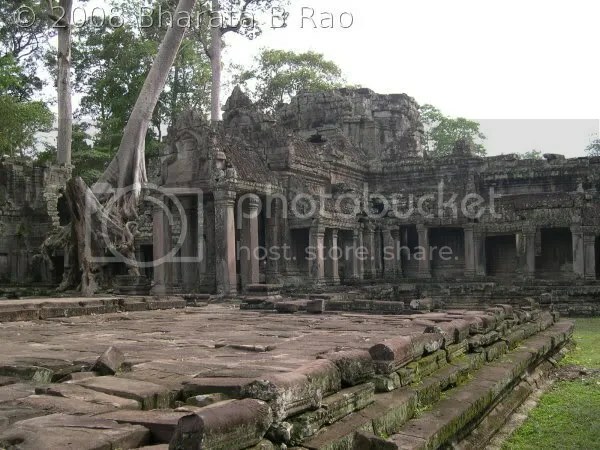 All the temples which we wanted to visit including the famous Angkor Wat are situated in the Siem Reap province of Cambodia. So our plan was to stay at Siem Reap for 3 days and cover most temples around the place. One can reach Siem Reap by Air, but our plan was to travel to the Thai border town Aranyaprathet and cross over to Cambodia and travel further on road. Vatsa suggested that we leave our luggage behind in Bangkok and carry only bare essentials to Cambodia. Accordingly we booked a room (we had to spend a night in Bangkok after returning from Cambodia before returning to Bangalore) and left most of our luggage in the hotel. Our day started at 3AM on Saturday morning. Since we were staying in the outskirts of Bangkok, we had decided to start from our Hotel at 4AM in the morning to catch the 5.55AM train to Aranyaprathet from Hualamphong Station. We could locate the right ticket counter and the right platform number with the help of an English-speaking person at the information counter. The train was an ordinary one with no marked seat numbers. We were one of the first to board the train. Ticket cost was 46 Thai Baht (THB). Throughout the journey, the train was full of activity with hawkers selling various food items. Once the train left the Bangkok city, the landscape changed: the high rise buildings gave way to green fields and the change was sudden and abrupt. Our entire week in Bangkok was spent amongst fashion-conscious young people and just a few kilometers away from Bangkok, the change in people’s attire was so noticeable. Our breakfast was completed with an instant coffee and an ultra big guava fruit. Our passports were checked twice: once while leaving Bangkok and next when nearing Aranyaprathet by Police. The entire train journey was through the country side and train stopped at every other station. The scenes at many stations were very similar: villagers waiting to welcome their friends/relatives who were arriving from the city. We reached Aranyaprathet at 12PM. We took a tuk-tuk (a two wheeler in the front joined to an open 3 wheeler at the rear) to reach the Immigration office at the border. This 5km journey cost us 100THB. Once at the border, we get surrounded by agents who offer to help us get Cambodian visa and arrange travel to Siem Reap. At the immigration office, there is a separate counter to issue re-entry permits, where we submitted TM.8 form with a visa fee of 1020THB. We got re-entry stamp without any hassles within 20min. Crossing countries through road was a first time experience to me. Once out of Thai immigration office, we enter the Cambodian territory. One has to walk around 200m to reach the Cambodian immigration office. But with no visible signboards, things get confusing and that provides ample business opportunities for touts. In our case, one guy started working as our guide even after repeated refusals from us. There is a huge difference in the road quality between Thai and Cambodian sides. While it is clean and asphalted in the Thai side, it becomes dusty and dirty in the Cambodian side. One can be forgiven for missing the Cambodian immigration office as it is a small room in one corner with 3 counters. Our entry was cleared within 15min and our guide led us to a bus stop from where we were picked up by a bus and dropped at a taxi counter (a distance of around 1km) free of cost. Taxi ride from Cambodian border to Siem Reap takes around 3.5 hours. Taxi can accommodate 4 people with 600THB for each. We shared the taxi with a Spanish couple. 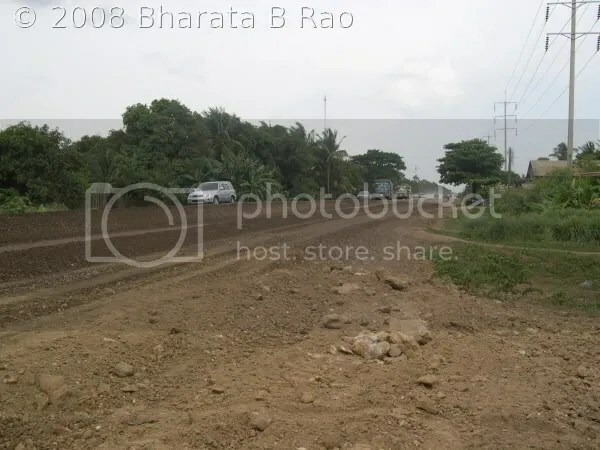 The entire ~150km journey to Siem Reap from Poi Pet border is mostly through un-asphalted road which is under construction at many places. But that made little difference to our driver and as he sped his Toyota Camry though the rough road. The weather was extremely hot and any passing vehicle would rake up a huge amount of dust reducing the visibility to zero. Even this didn’t bother our driver. Though it was largely entertaining for us, we had a couple of scary moments when our vehicle was on wrong side with zero visibility but still racing ahead at 60kmph and when our heads managed to dash against the car’s top ! The way the villagers, specially the students on bicycles gave way to taxis at slightest notice told us how feared these taxis are on this road. The road passes through many villages and we could see tender coconuts being sold at many places. We tried in vain to explain our driver to stop at one such place, but finally showing a coconut tree did the trick. The fresh tender coconut water gave us a huge relief from the heat. I can’t remember when was the last time I saw such huge coconut in Bangalore. We reached Siem Reap at 5.15PM. Thankfully, the road conditions changed abruptly as we entered Siem Reap. We had to take a tuk-tuk to reach the Palm Village Resort. This resort was outside the city (~3km out of the main city area!) and hence we were supposedly charged more (3$). Our next 3 days were going to be hectic. We ended a long day with dinner of MTR RTE food. The hotel staff were kind enough to accommodate our special request to heat MTR packaged food for us. The heat of Cambodia was a bit too much for me and yesterday whole day I was almost drenched in sweat. Hence we decided to start our temple visit quite early in the day. In the first day, we had planned to cover the temples in the Angkor Thom area and hired a tuk-tuk(15$). The tuk-tuk driver first took us to the Angkor entrance where we purchased tickets to visit the Angkor temples. These tickets need to be produced at every temple in the Siem Reap area (including Banteay Srie and Kbal Spean). We purchased a ticket valid for 3 days by paying 40$ per ticket. We had to pass the famous Angkor Wat temple to reach the Angkor Thom area. Angkor Thom area has a cluster of temples. The first temple we visited was Bayon, the temple with faces. 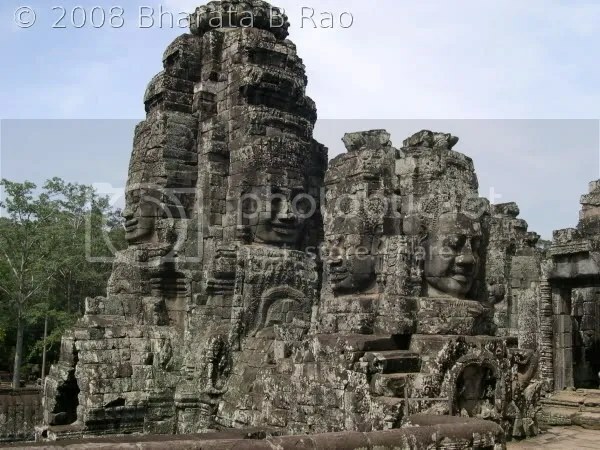 Bayon is a Buddhist temple built by King Jayavarman VII in 13 AD. Bayon is very unique with huge-sized King’s face carved on Gopuram-like structures. The temple is built at many levels and one has to climb many stairs to reach the next higher level. 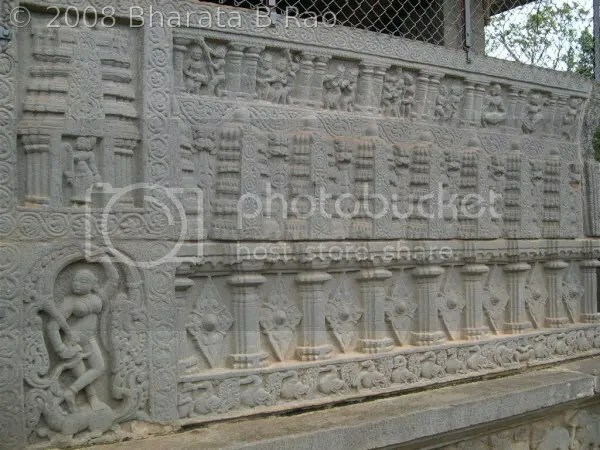 The outer walls of the temple have been carved with depictions of war scenes. Interestingly there are a few marine war scenes also. 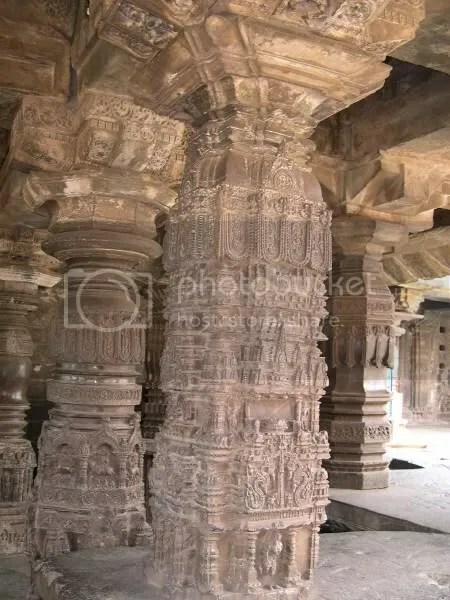 Many pillars with Apsaras can be seen. 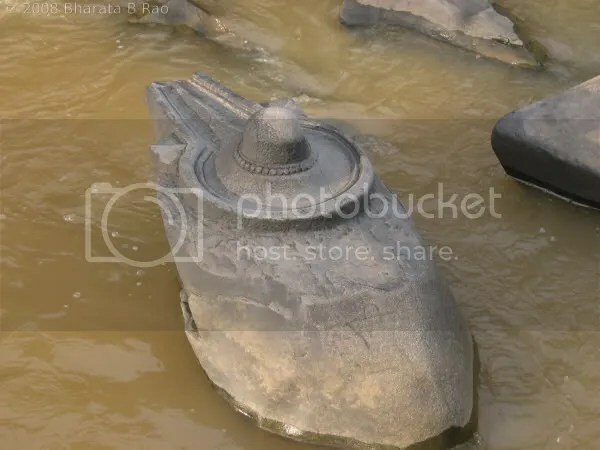 We could see a few Shiva Lingas also in this temple. 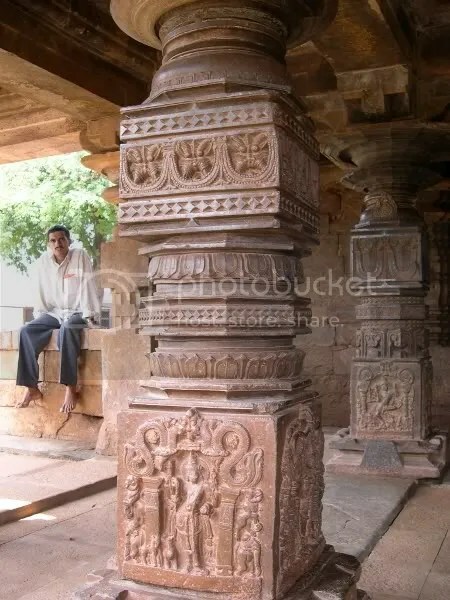 We could see miniature pillars (supporting the doors and windows) which reminded us of the Hoysala-style pillars. As we reach higher, we came face to face with the King’s faces. On the topmost level one can see King’s faces all over the place. The temple is fairly big, very impressive and we took 2 full hours to cover the temple. 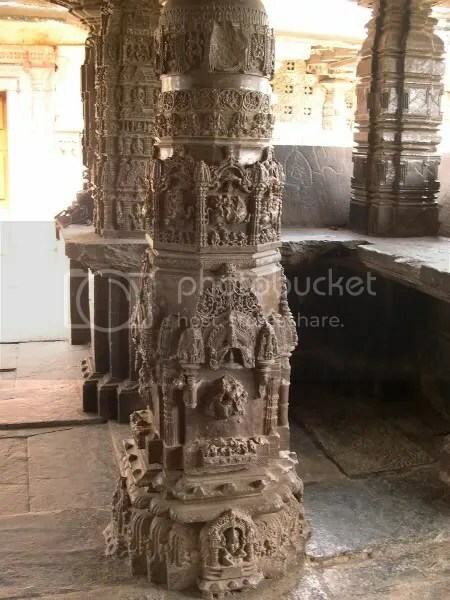 In Indian temples we are used to seeing a carving out of single stone but here most carvings comprise of multiple stones. It is hard to imagine how the sculptor has achieved this level of alignment and precision with this style. The next temple, Baphuon was under restoration and we could only get an extenal view of the temple. Next we climbed the steep stairs of the Phimeanakas temple which was mostly in ruins. 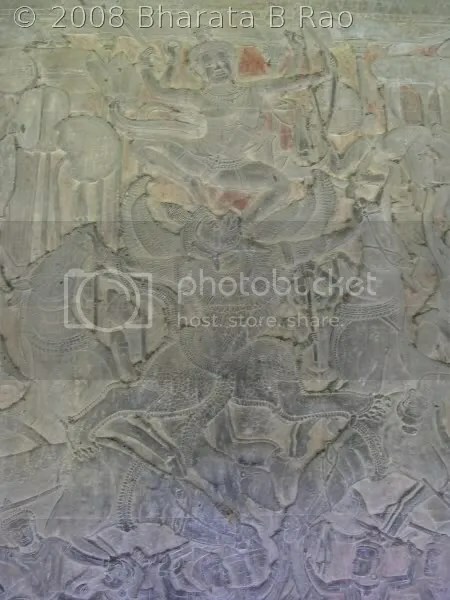 An interesting legend is associated with Phimeanakas. 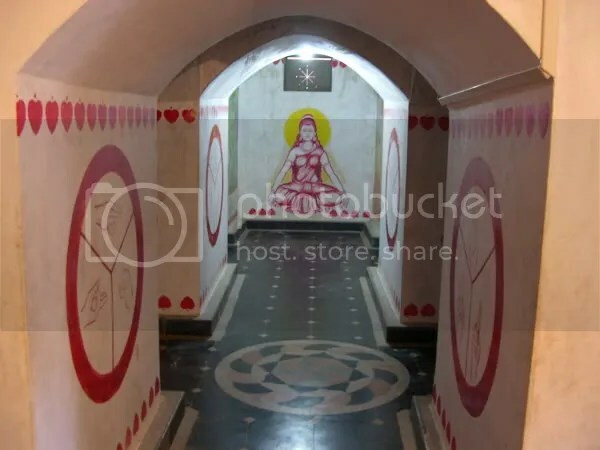 It is said that the King would visit a Serpent disguised as a Woman (Nagini) every night at this place. Next we saw Elephant Terrace and Leper King’s Terrace. 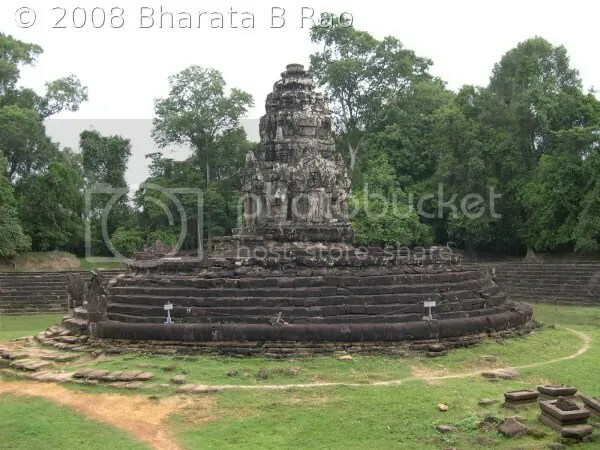 These two places are quite close to Bayon. Elephant Terrace is a long platform (300m wide and 2.5m high) with walls engraved with life sized elephants, Garuda and Lions. It is said that King used to view his elephants’ procession from this terrace. 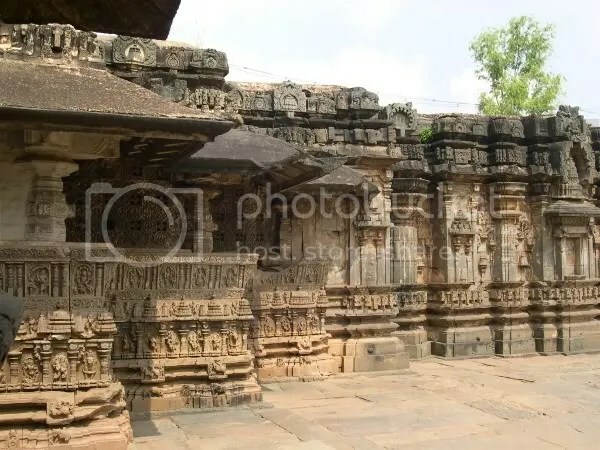 Leper King’s Terrace is more beautiful and bigger than Elephant Terrace with fine carvings of demons, mythological figures and Nagas on the walls. 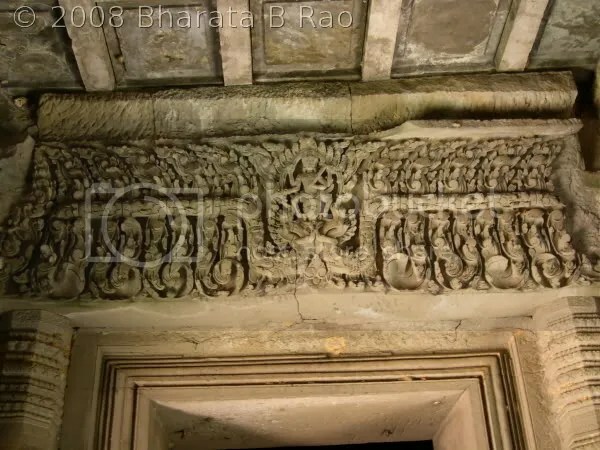 The walls are packed with carvings, at some walls up to 6 different levels of carvings can be seen. I had read that one could find many beggars (some of them amputated because of land mine blasts) around the temple area of Siem Reap. But we could find only a few of them. Near Elephant terrace a girl child of around 10 years was accompanying a boy of around 3 years and the little one had a fall and he started crying. Moved by this, when we offered a denomination in Riel (Cambodian currency), the girl flatly refused to accept it and instead demanded dollars from us! It had already come to our notice that dollar was the most preferred currency here, and it got confirmed now. Even beggars preferred dollars. The girl persisted with us for some time, and accepted Riel when it became clear to her that we aren’t parting with any dollars. The first thing that catches our attention around any temple here are the children selling various items to tourists. Any foreigner visiting the monuments get surrounded instantly by a bunch of children competing to sell their items for a few dollars. Interestingly, most of these kids have picked up enough English to converse comfortably with the tourists. As anywhere else in Siem Reap area, the prices are inflated by at least 3 times and you are expected to bargain. Our post lunch session started at 3PM with a visit to Preah Khan temple which is located a few kilometers away from the Angkor Thom. 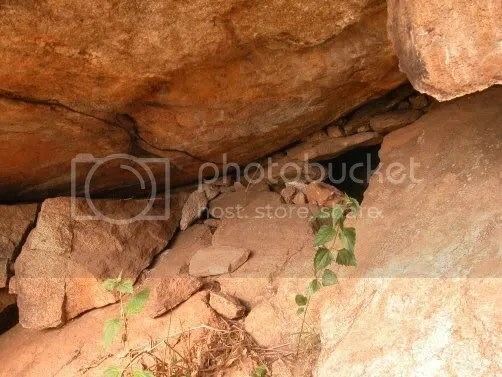 On either side of the entrance there is a huge snake (may be around 50m long) structure supported by Devas and Asuras on either side. 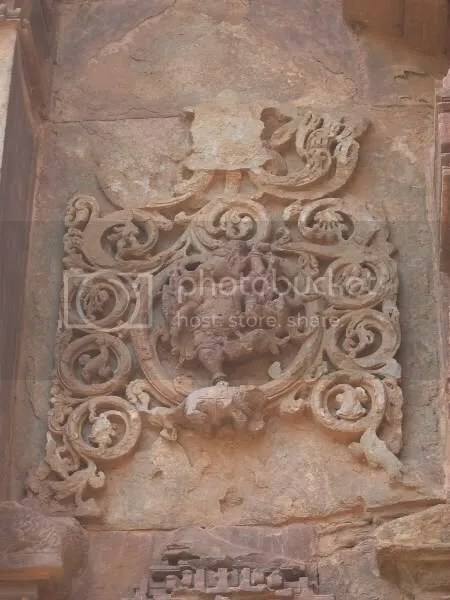 This arrangement could be seen at a few other temples and at all fort entrances (4 in number, one in north, south, east and west). 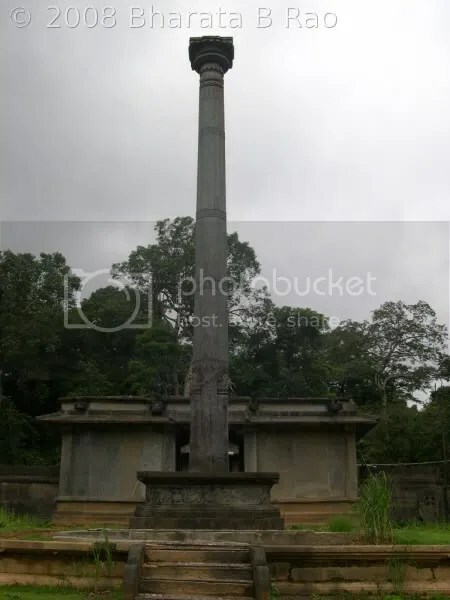 However at most places, this monument is in ruins and I don’t remember seeing even one complete snake hood without any damage. Preah Khan (translates as Sacred Sword) is a fairly big Buddhist temple with a large part of it in ruins. However whatever that remains, is worth a visit anytime. 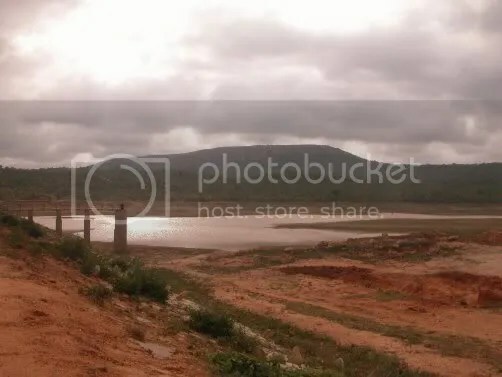 Proceeding along the same road, the next temple we reached was Neak Poan, a temple in the middle of an artificial reservoir (was devoid of any water when we were there). 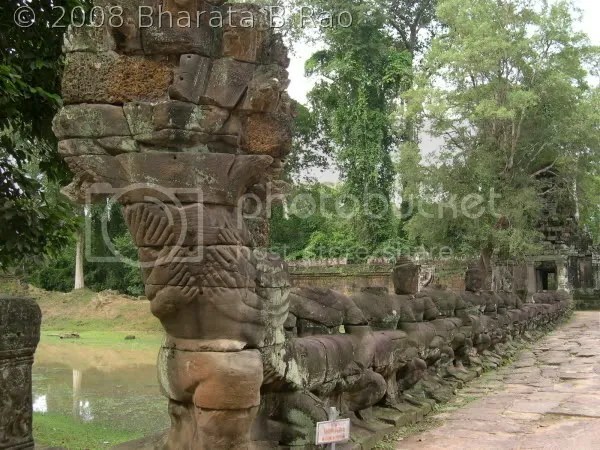 Neak Poan is a small temple with two gigantic serpents encircling it. The information board at the monument mentions that the reservoir’s original dimension was 3.5×0.9km and the water had curative properties. 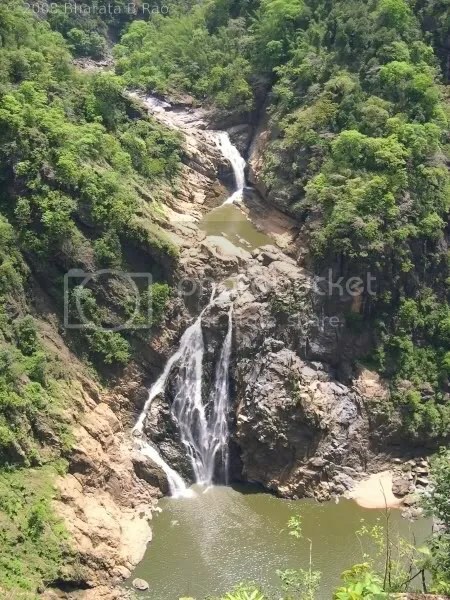 With water around, Neak Paon would have looked very nice. 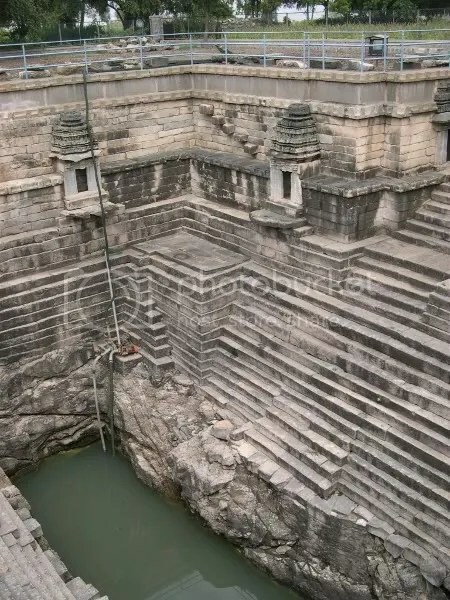 We could locate a reservoir gate made of stones which probably was used to control the level of water around the temple in its prime years. The tuk-tuk driver next took us to Ta Som. 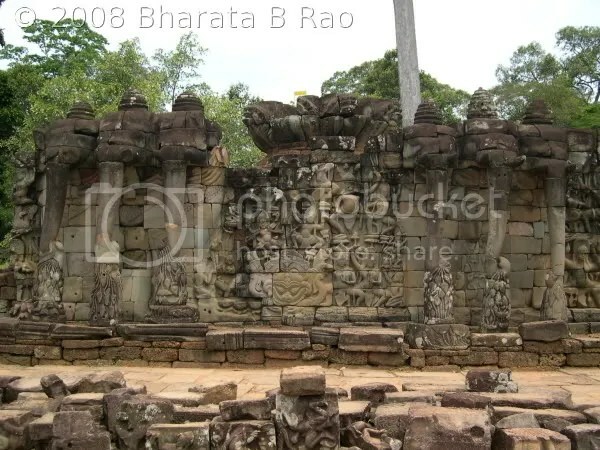 Most of Ta Som is in ruins. 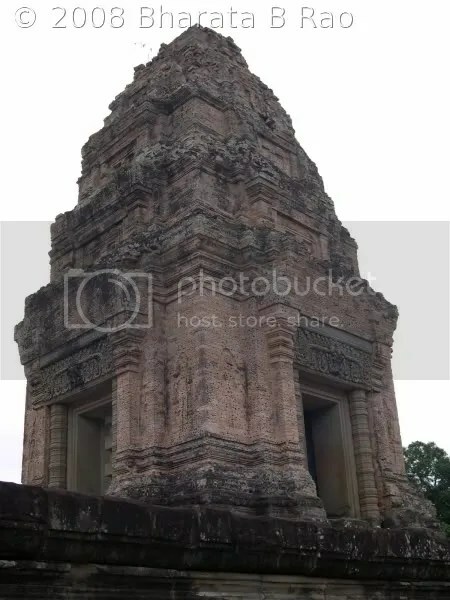 The internal style of Ta Som appeared very similar to Preah Khan. Ta Sam was relatively smaller compared to others we had seen. The highlight of the temple was a monstrous tree growing on the temple. It looks awesome as if ready to swallow all the stones hindering its growth. The nature’s strength is at display here and it would have taken hundreds of years for the tree to assume this proportion. So it is very hard to imagine how this sort of extra growth on a temple could have gone unnoticed to mankind. The next temple we visited was Maebon (East). This was the first Hindu temple(dedicated to Shiva) we were visiting. 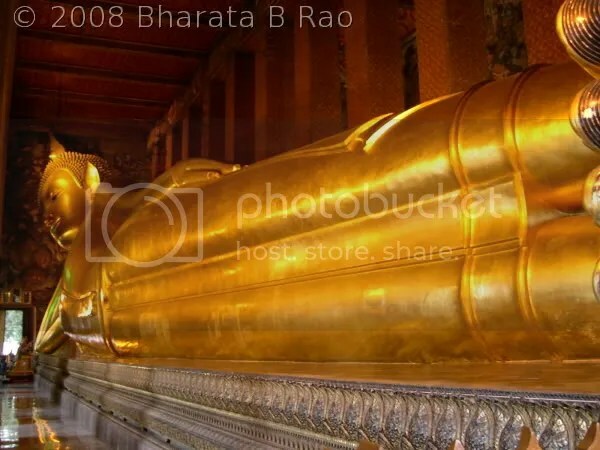 All the others till now had been Buddhist temples. This temple looked very different. 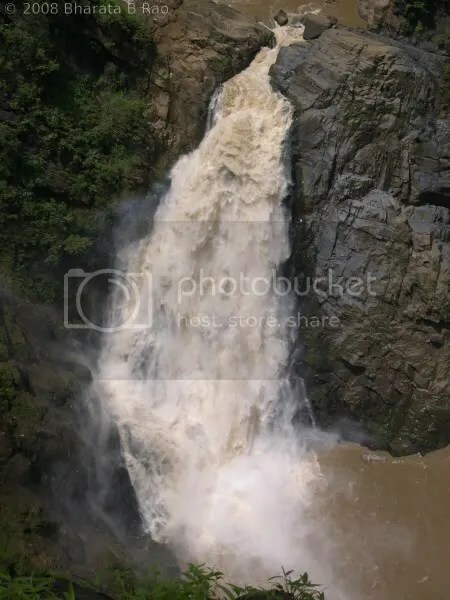 It rises to a considerable height with 3 levels and has 5 huge Gopuras. Again many parts of this temple are also in ruins. The kind of stone used here probably also contributes to its degradation. 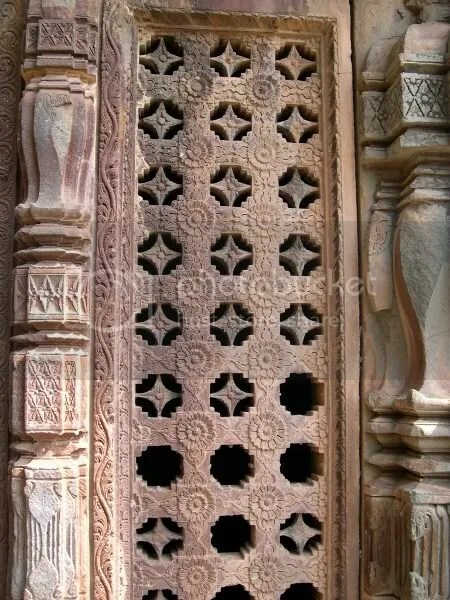 The stones in the entire temple have developed holes (probably due to natural reasons) and this itself gives a distinguishing appearance to the temple. 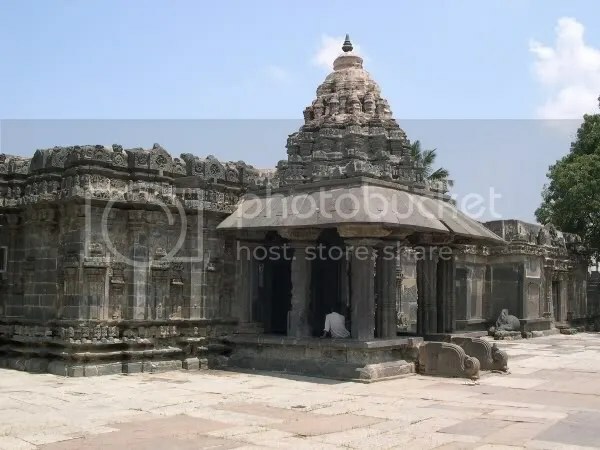 Some of the stones used in the temple closely resembles the bricks typically used in Coastal towns of Karnataka for building houses. It takes a bit of effort to reach the topmost level of the temple, but the panoramic view from the top justifies the effort. The last temple we saw in the day was Pre Rup, a Hindu temple. 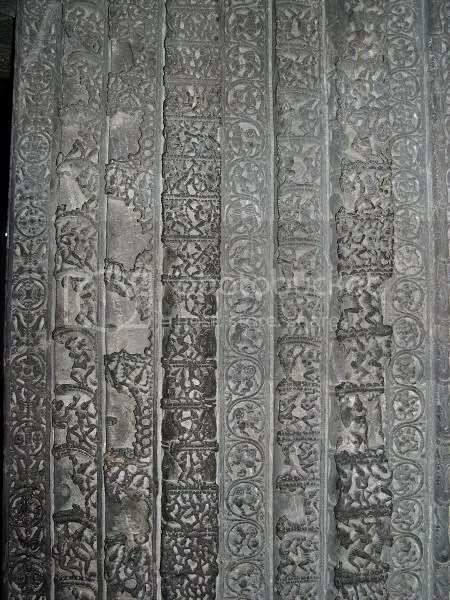 To us, this appeared architecturally very similar to Maebon, with same type of stone used in its construction. This temple raised to a good height and we could see lots of tourists at the top waiting to catch a glimpse of sunset from here. It was 30min past 6 in the evening when we came out of Maebon. It had been a long day in the hot sun. We lost lots of body fluid, but fresh coconut water, available at every temple served as our regular replenishments. This day was reserved exclusively to visit Angkor Wat which boasts of world’s largest temple complex measuring 1sq km. Since now we had become fairly familiar with the Angkor area, we decided to hire bicycles for our 2nd day’s tour(3$/day). The tourist crowd at these temples are so much that it becomes difficult to photograph a monument without any human in the frame. So we reached Angkor Wat quite early at 7.30AM. At the entrance of Angkor Wat, we are welcomed by huge sculptures of Lions and Snakes. The temple is surrounded by a moat which needs to be crossed using a bridge of couple of hundred meters length. The temple complex is so huge that we had to walk a few hundred meters to actually reach the temple proper. The temple is built at multiple levels with steep stairs provided to reach a next higher level. 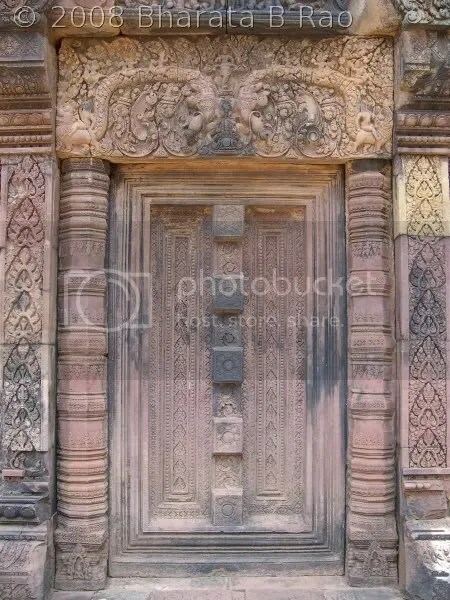 The best carvings of Apsaras can be found in this temple. The height of the temple at some places were such that, my camera wasn’t able to get the entire temple wall in a single frame. One can be left wondering about the sheer magnitude of this temple. We covered the interiors of the temple first and reached the back of the temple within an hour. The temple seemed to end so quickly and we stood wondering where we had missed the most important part of Angkor Wat, the bas-reliefs (carvings projecting slightly outward from the background). 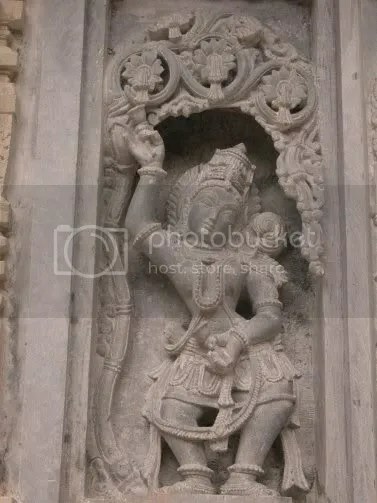 Then some carvings on the exterior walls of the temple caught our attention. 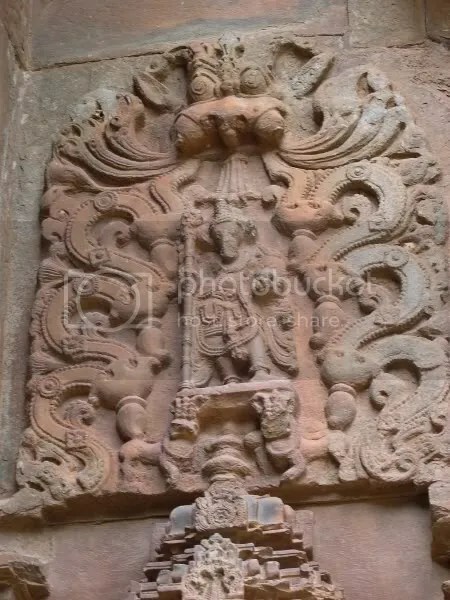 It had a depiction of Samudra Manthana, the churning of the ocean, by Devas and Asuras. The bas-reliefs should be covered in the anti-clockwise direction, but we ended up doing it clockwise. With this I had to sometimes cover the entire wall, and re-do it clockwise to get a complete picture. 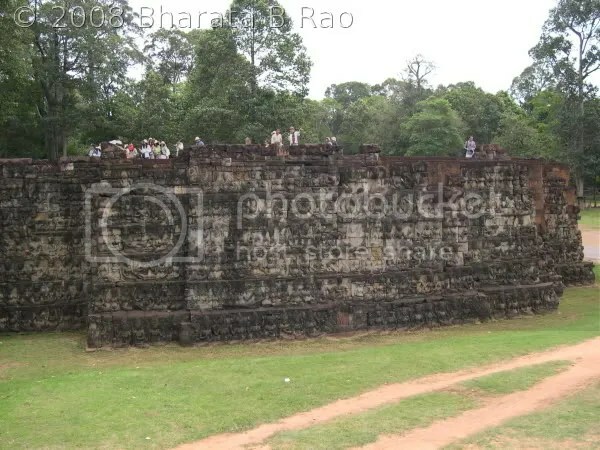 The exterior walls have depictions of battle of Ramayana, battle of Kurukshetra, Yama, Heaven and Hell, army of King Suryavarman II. 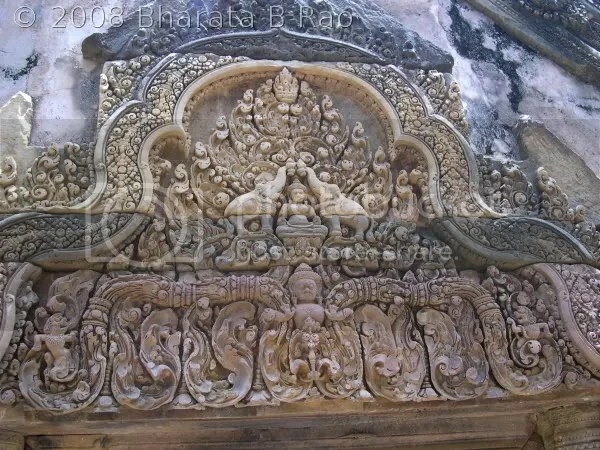 We could identify most of the characters in the carvings here. 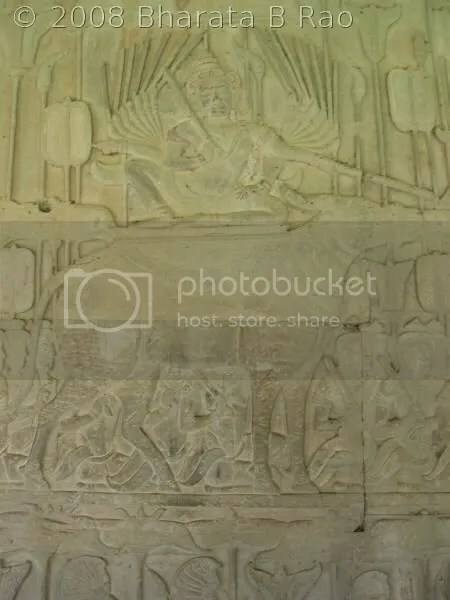 Angkor Wat was originally a Vishnu temple and we could find many carvings of Garudavahana Vishnu. 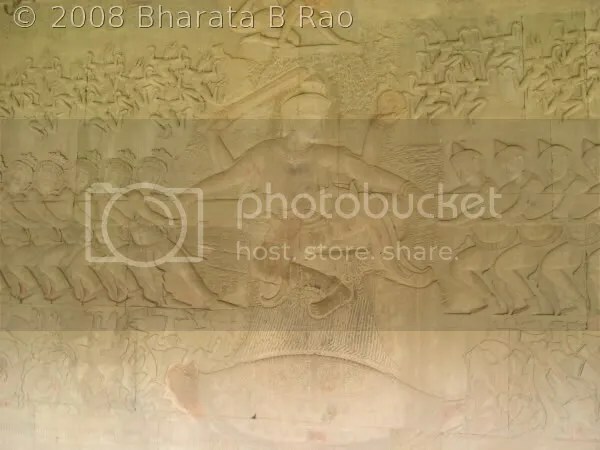 The battle of Ramayana shows Vanara Sena, Rama, Lakshmana, Hanuman, Vali, Sugreeva etc. The depictions of Heaven and Hell is very interesting with very violent torture scenes like piercing a person with nails. One of the characters easily identifiable from the battle of Kurukshetra is Bheeshma on bed of arrows. 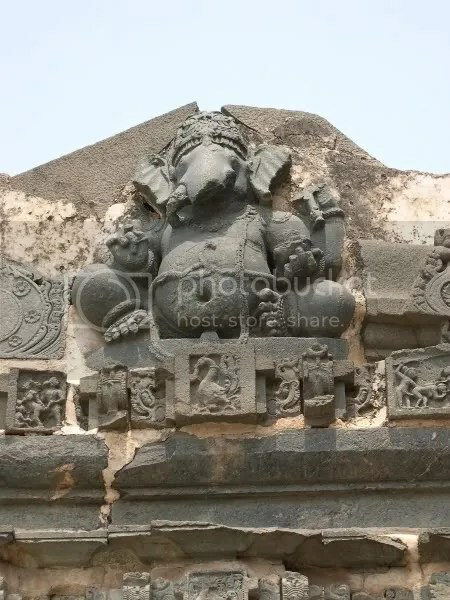 We could also find many other Hindu Gods like Ganesha, Indra and Varuna. 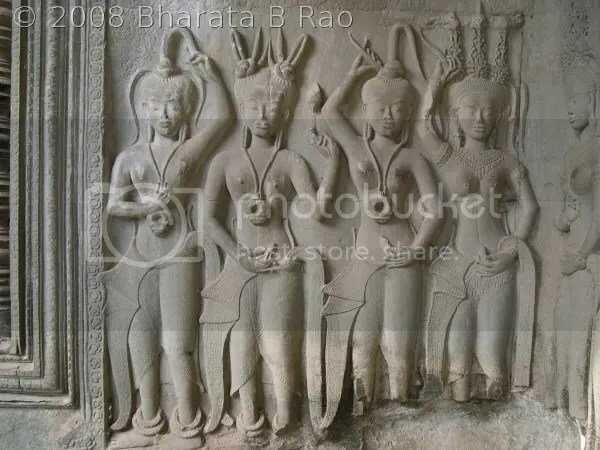 We took close to 2 hours to cover all the bas-reliefs and I left the temple with only one feeling – a sense of satisfaction. 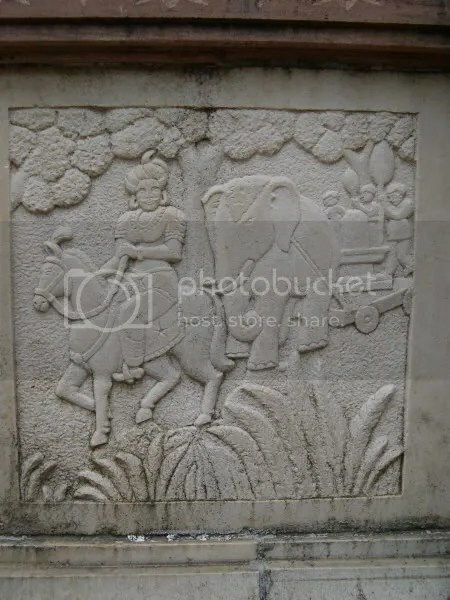 I felt that my visit to Cambodia has been worth with this visit to the bas-reliefs of Angkor Wat. It was 11.30AM when we came out of the temple complex. We decided to cover Thommanon temple before retiring for the day. We had to bicycle a few km in the hot sun to reach Thommanon. Thommanon is a small Hindu temple dedicated to both Shiva and Vishnu, but we found only the Buddha idols in the Sanctum Sanctorum. 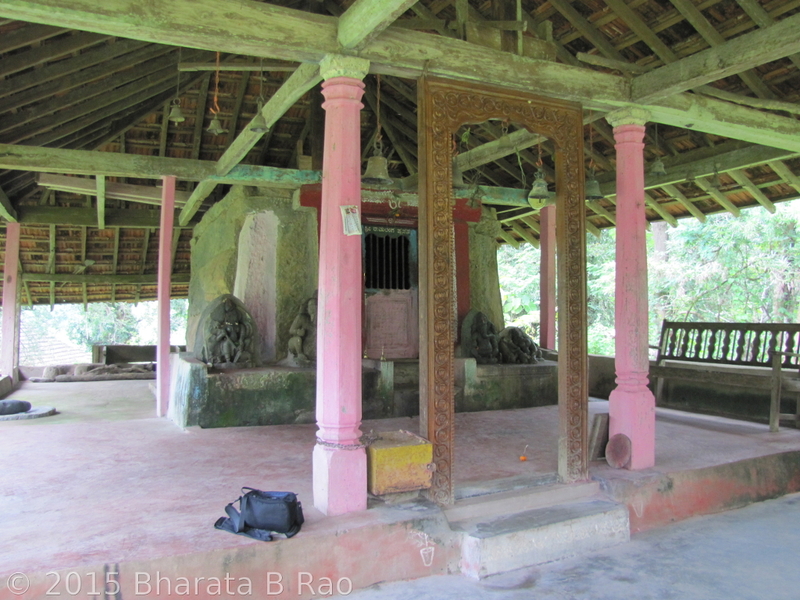 This 12th Century temple is in a good condition compared to others from the same period. 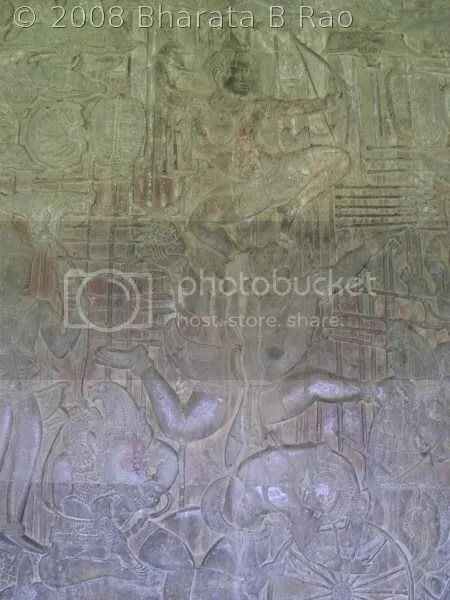 However coming from Angkor Wat, the art work here would seem dull as the outer walls of the temple are mostly undecorated. Opposite to Thommanon, across the road is the Buddhist temple Chau Say Tevoda, to which we gave a brief visit. However this temple is mostly in ruins and not yet restored fully. We had planned to see only Thommanon, but we couldn’t resist a visit to Ta Keo, which is a few km ahead of Thommanon. 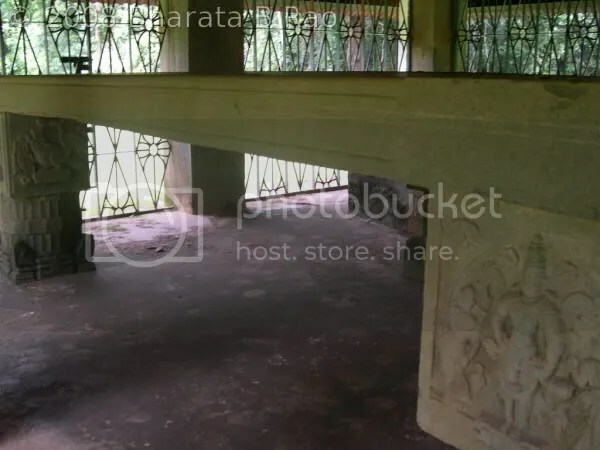 Ta Keo is a fairly big Hindu temple dedicated to Shiva, but as with other Hindu temples here, the only remains are usually the dislodged Shiva Linga. 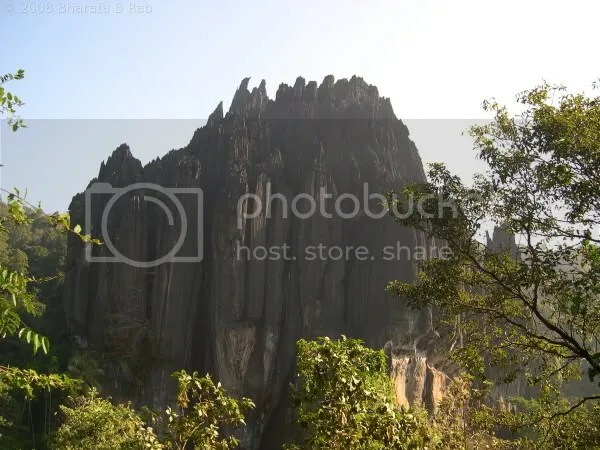 Ta Keo is built in several levels and raises to such a height that it is referred to as temple-mountain. Only physically fit can negotiate the steep climb and reach the topmost level of the temple. The construction of this temple is said to be incomplete. Both Vatsa and I were on bicycle after many years, and it was a long tiresome ride back to the Hotel. In the evening we spent a couple of hours shopping in the Old Market Area of Siem Reap. Shopping here is an entertaining experience with most of the shops competing with each other to sell similar goods. Hard bargaining is the way to go and nobody gets offended if we start bargaining from one quarter of the quoted price. On day 3, we left the Hotel at 8AM by taxi(45$) towards Kbal Spean, which is at around 50km from Siem Reap. 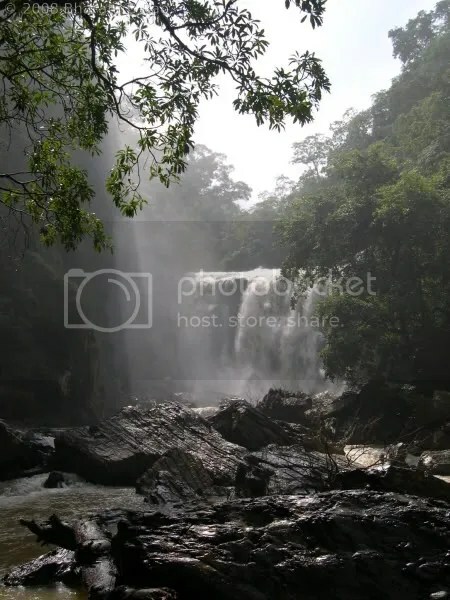 We passed Banteay Srey on the way, but our driver advised us to visit Kbal Spean first as it involves a climb, which is best done when the sun is still mild. 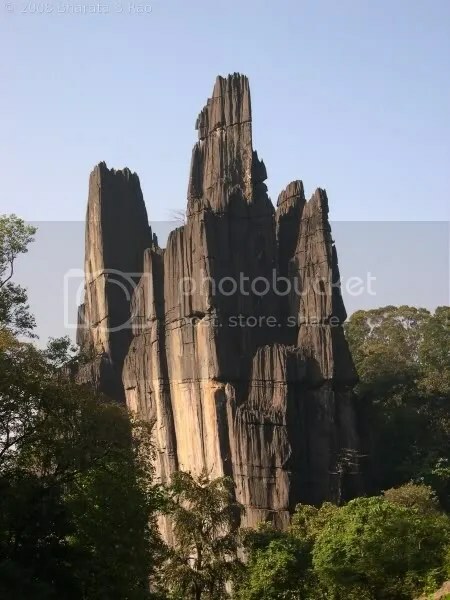 Kbal Spean is Cambodia’s version of our Sahasralinga (Thousand Lingas) present at Sirsi, Karnataka. 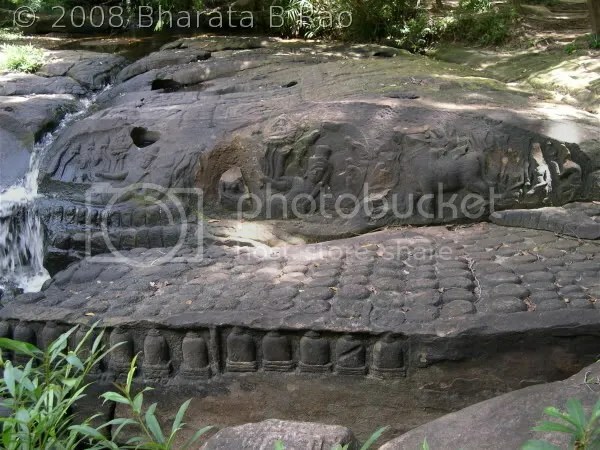 This place also has lots of Lingas carved on the rocks of the Kbal Spean river. We had to do a 45min walk (a mild climb actually) to reach the actual place where Lingas are located. 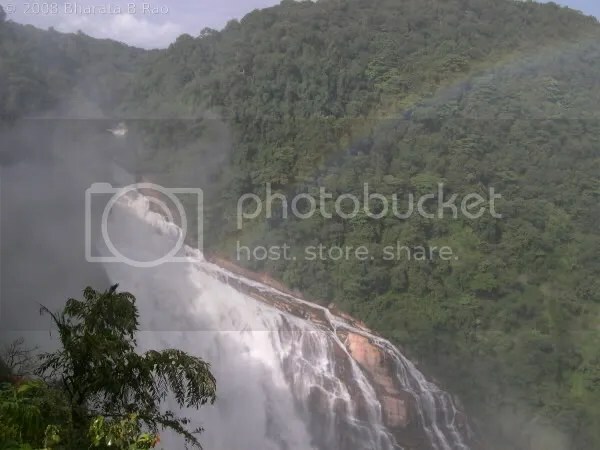 The place is very scenic located right in the middle of a dense forest. 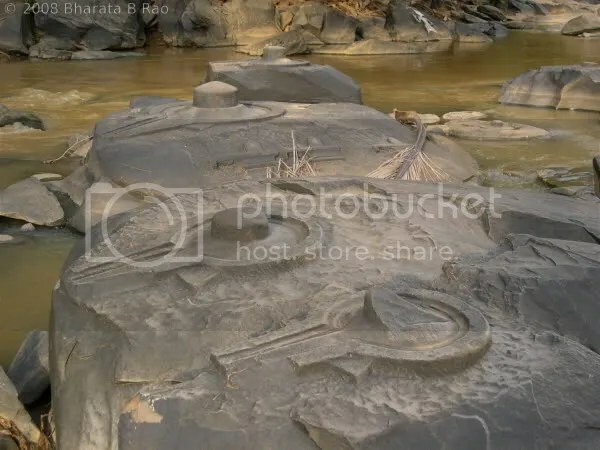 The water level in the river was low and hence all the Lingas carved on the rocks were clearly visible to us. 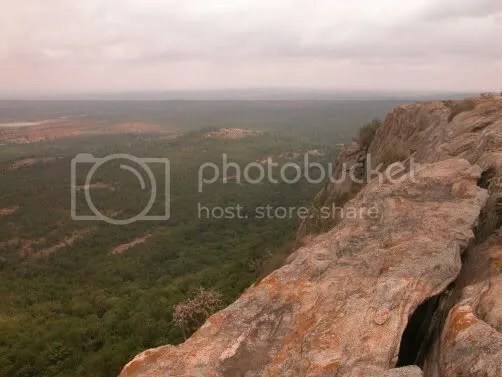 In this place, the river mostly flows on a rock bed and most of it has been carved with Lingas. Unusually we could find many Lingas in a single Yoni. I don’t remember seeing this anywhere else. 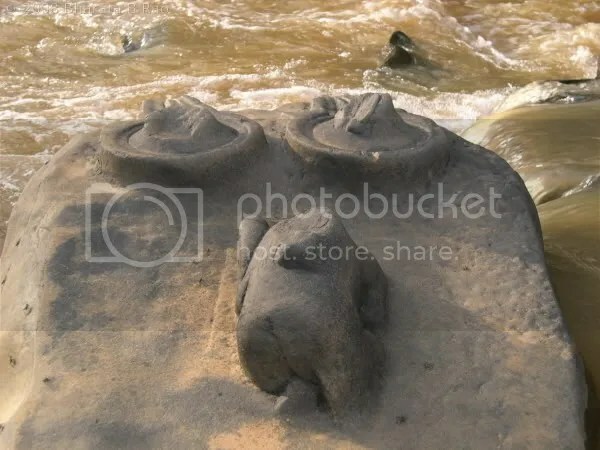 Apart from Lingas, there are carvings of reclining Vishnu and Shiva with Uma on Nandi. 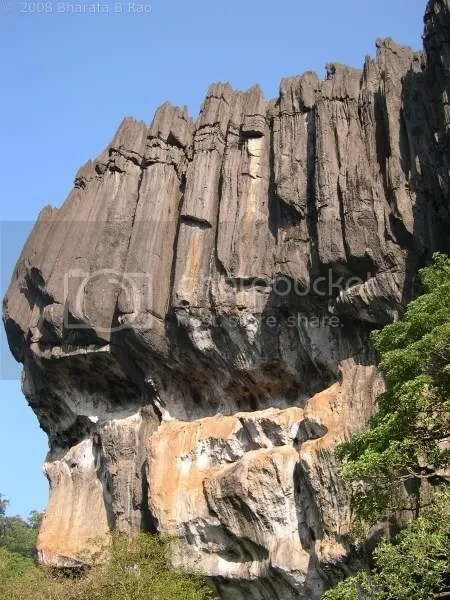 Vishnu and Shiva can be seen on many rocks. 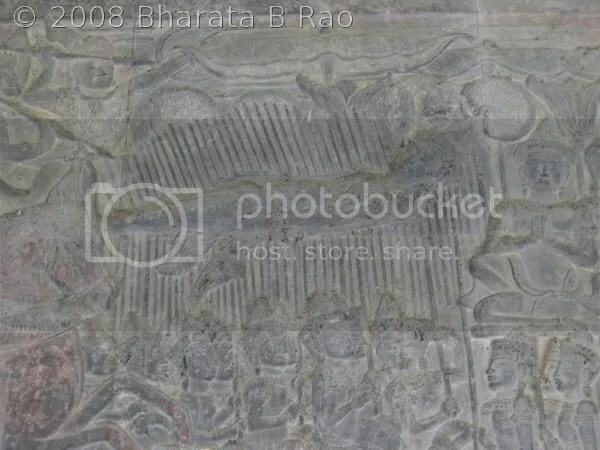 There is also a carving of Brahma on a lotus flower. 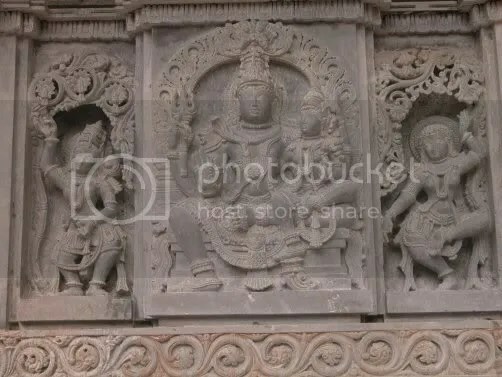 So this is a very unique place in the midst of green settings with the Hindu trinity: Brahma, Vishnu and Maheshwara present side by side. This surely must have been considered a very holy place when these carvings were done (11th to 13th AD). On our way back from Kbal Spean, we stopped at Banteay Srey. 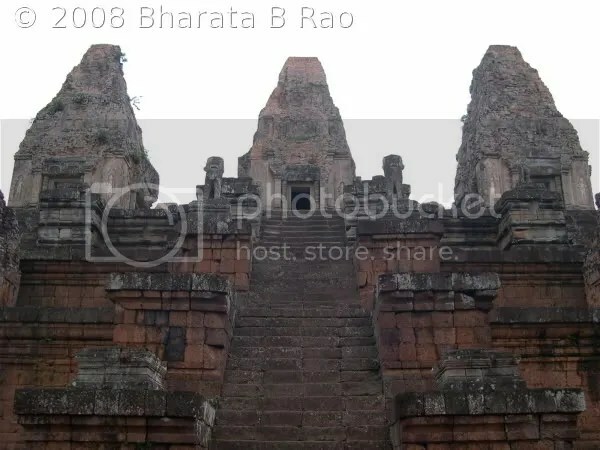 This 10th AD Hindu temple is constructed form pink sandstone. 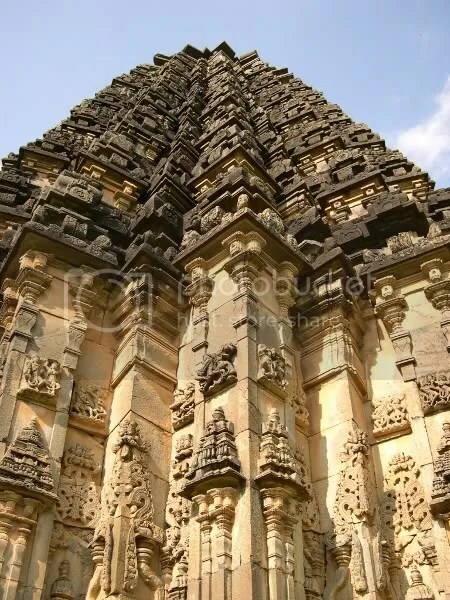 The temple stands out from rest of the temples with its intricate carvings. The artwork is very fine and is a pleasure to watch. We can see many references to Hindu Mythology in this temple. Angkor Wat has almost become synonymous with Cambodian temples, but we would have surely missed something had we not seen Kbal Spean and Banteay Srey. On the way back from Banteay Srey, we paid a quick visit to Banteay Samre temple. The weather had turned cloudy and there were no tourists in the temple, which made the temple visit even more special. I would probably remember the quiet moments spent in this temple for many more years to come. The silent stones of this temple had the power to take us back in time. As we walked out of Banteay Samre reluctantly, it started to rain as if to signal a climax to our Cambodian temple visit. 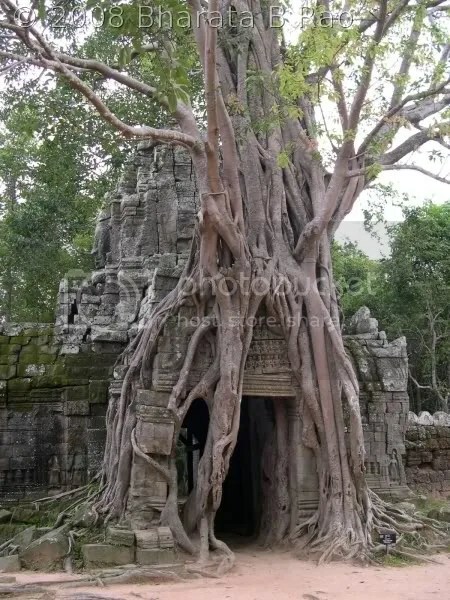 We were satisfied having seen most of the significant temples in the Siem Reap area, but our driver mentioned that we had missed an important one, Ta Prohm. So unwilling to send us back without a visit to this, he kindly drove us to Ta Prohm, which is near Angkor Thom area. 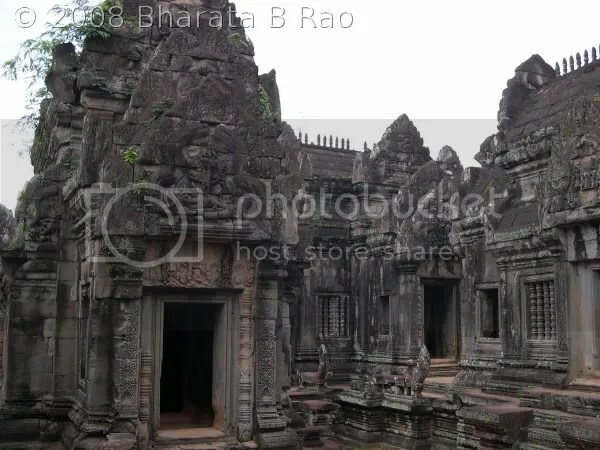 Ta Prohm appeared very similar to Preah Khan but much bigger. 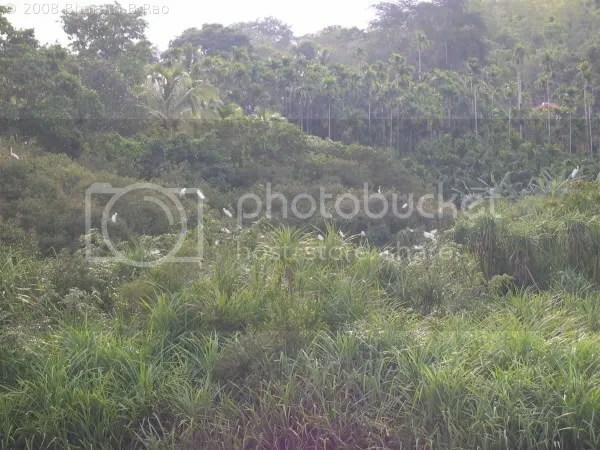 However many parts of the temple are still covered by the jungle overgrowth. 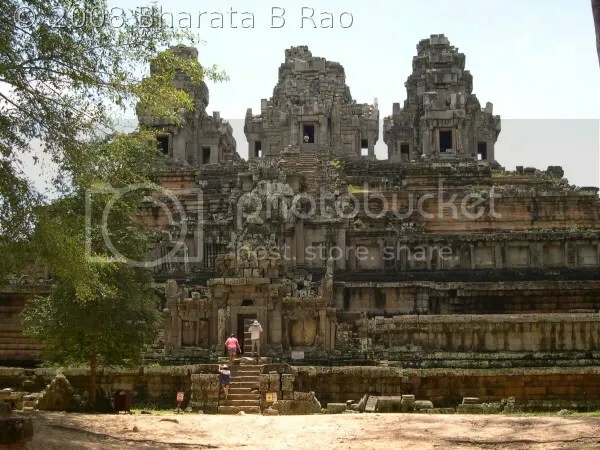 Most Cambodian temples have been restored with other countries’ aid and Ta Prohm and parts of Angkor Wat have been restored with India’s help. We were back at the Hotel at 2.30PM and rest of day was spent at the Hotel itself as rain didn’t allow us to venture out. We had been mostly using our own food stuff (MTR food), but for the dinner, we were insisted by the Hotel staff to try out their rice and vegetarian curry which turned out to be very tasty. We started back to the Cambodia-Thailand border early next morning. 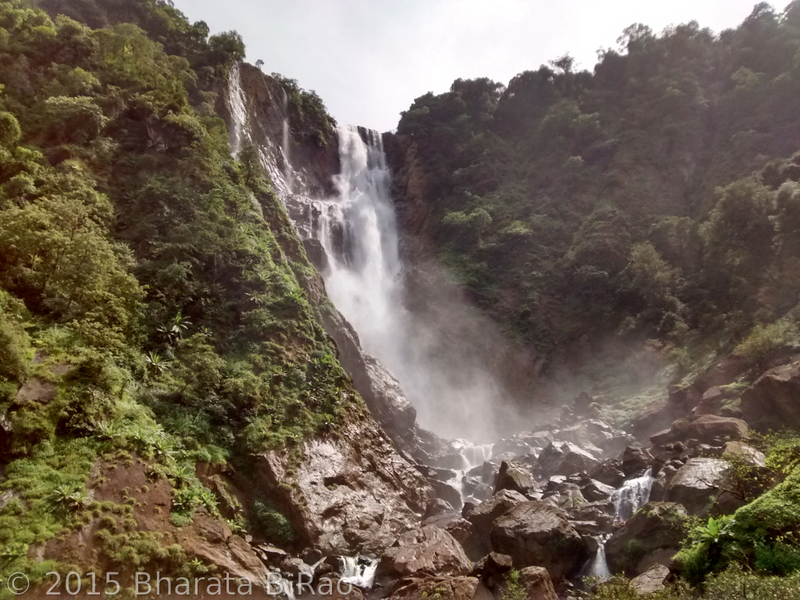 It was again a rough ride, but this time it had become even more interesting with rains. But this time, our driver was a bit conservative and turned down our request to drive faster. We were in Aranyaprathet, Thailand by around 12PM and the train to Bangkok was at 2PM. Unwilling to wait, we decided to take a bus to Bangkok and reached Bangkok by evening. We were too tired and ended the day early. Next day we had some time to spend in Bangkok as our flight was in the night. 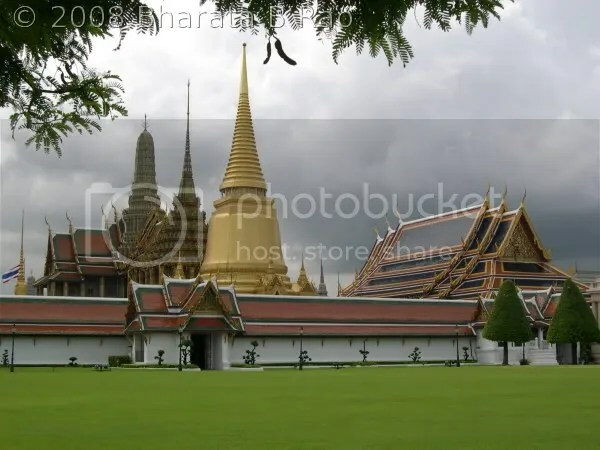 We took the opportunity to visit the Bangkok palace and a nearby Buddha temple. Also we managed to spend a few hours at the MBK shopping mall. 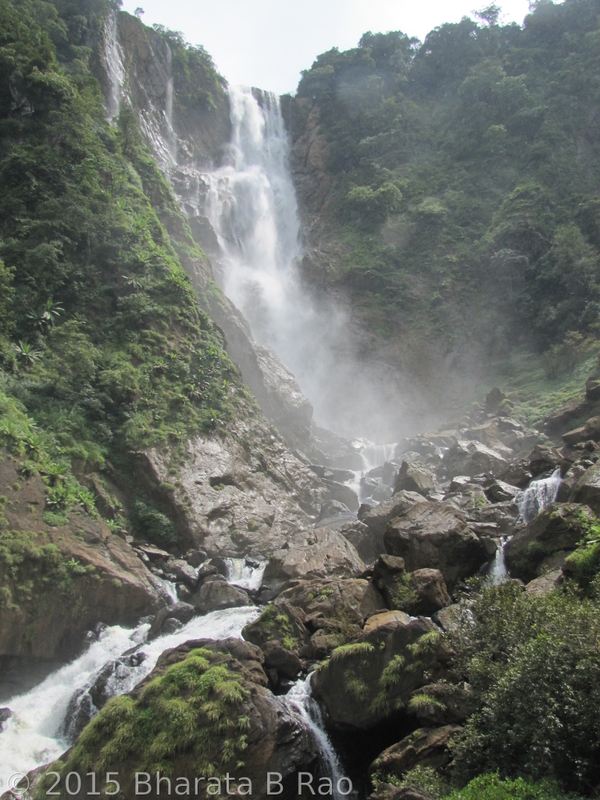 It was mid June when we decided to inaugurate this year’s trek season by a mild day’s trek to Muninagara. As usual Naren and I were ready and we managed to pull in Ashok also. 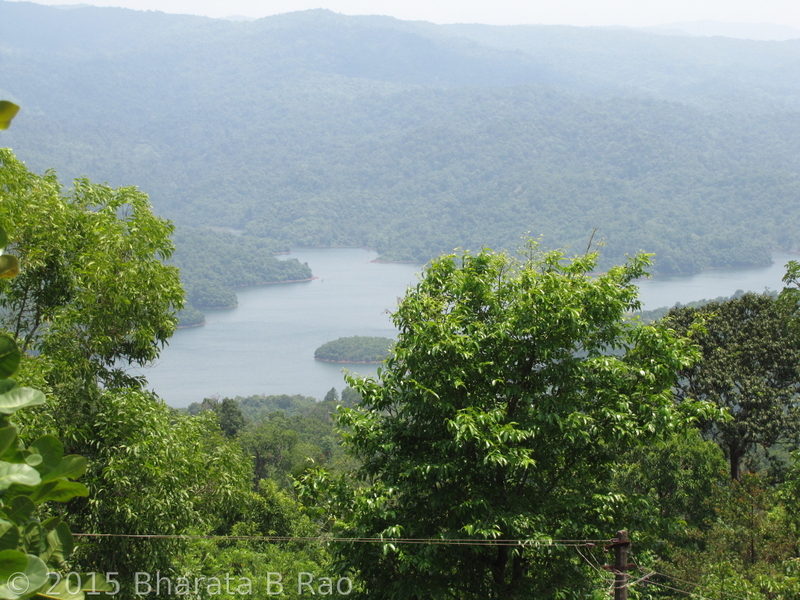 Muninagara is a tiny village situated at around 30km from Bangalore on the fringes of Bannerghatta National Park. The approach to the village is though from Kanakapura Road. Since we were a short group of just 3, we had decided to take our bikes. So on a cold Saturday morning, we were out on our bikes on Kanakapura Road. First thing on our mind was of course the breakfast. But it was too early in the day to find any hotels open. The couple of hotels which were open weren’t ready to serve anything. Finally we found a Darshini Hotel which served us hot Idlis with burning hot Sambar. We also picked up a few items from a bakery to energize ourselves during the trek. To reach Muninagara, we have to proceed on Kanakapura Road until Kaggalipura where we need to take a left diversion towards Gulukamale. 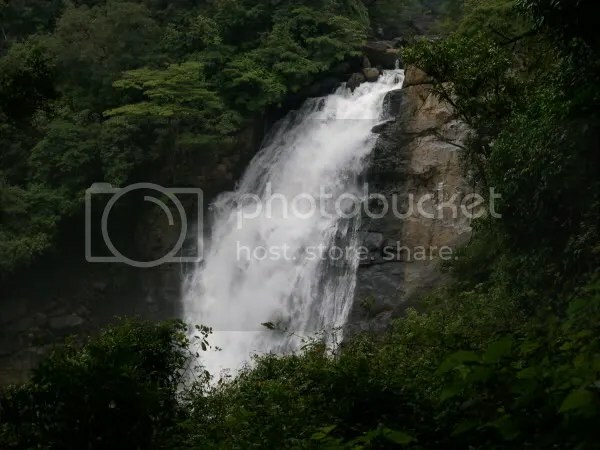 Once we reach Gulukamale, we need to take a right diversion, pass a couple of villages on the way before reaching Mukkodlu. 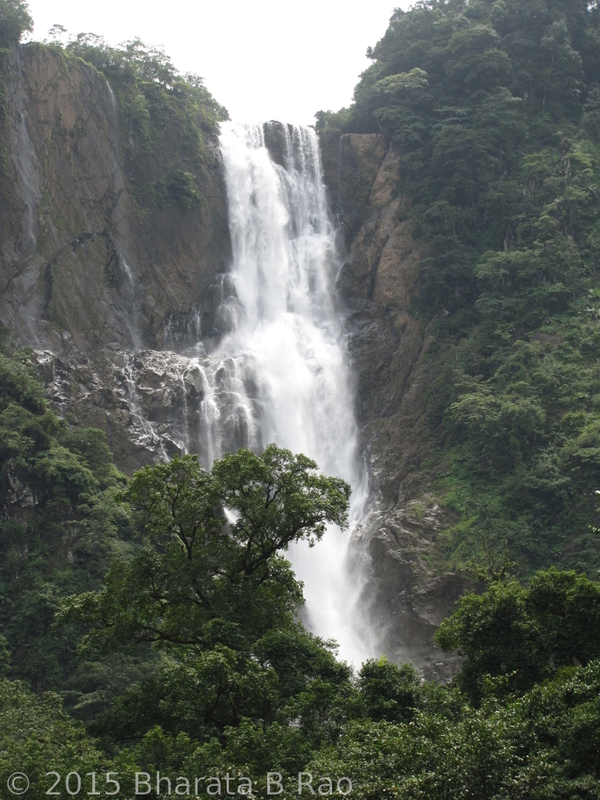 From Mukkodlu, it is again around 2km to Muninagara. Since we planned to enter the elephant habitat in Muninagara, we didn’t want to take chances without a proper guide. 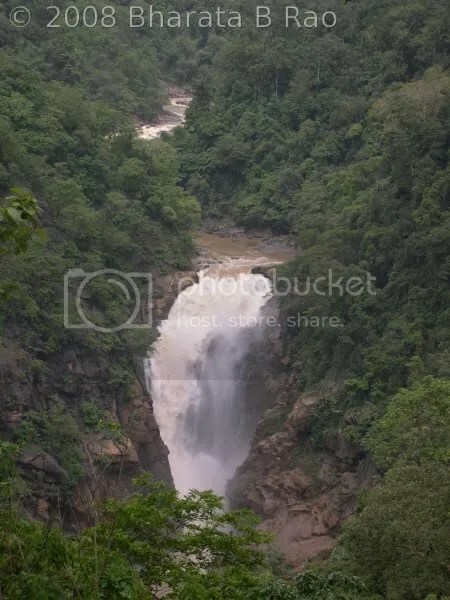 When we enquired for a guide at Mukkodlu, we were fortunate to find a right person for our job, Munimadayya, who knew everything about the caves and jungles of Muninagara. 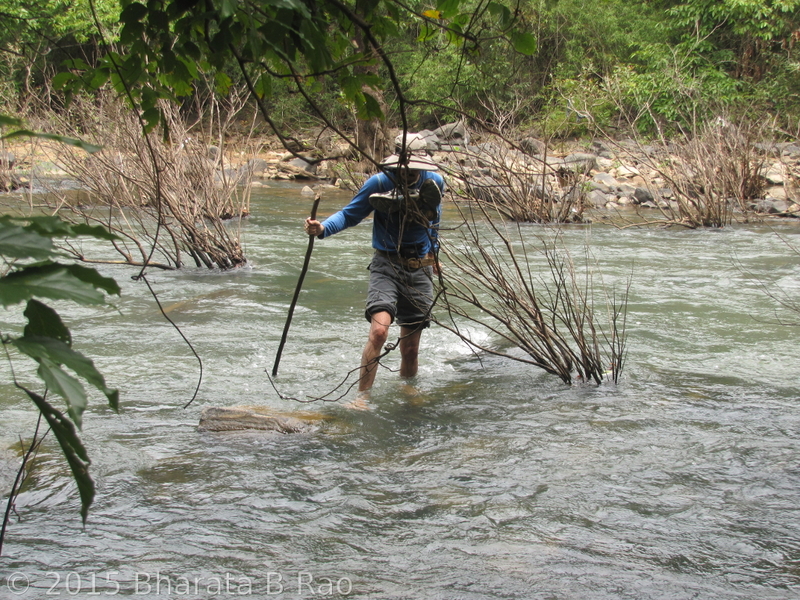 So with him we travelled further to reach our guide’s hut in Muninagara village. The hut is situated right next to the Muninagara lake. 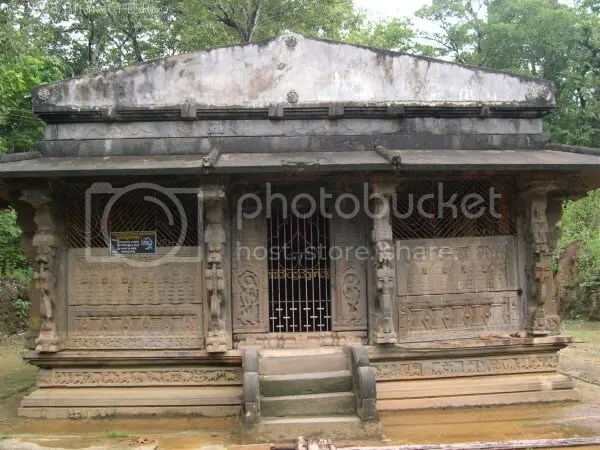 It should be easy to locate Munimadayya’s hut as it is the last hut in the village’s periphery. The lake area is huge but it wasn’t full. 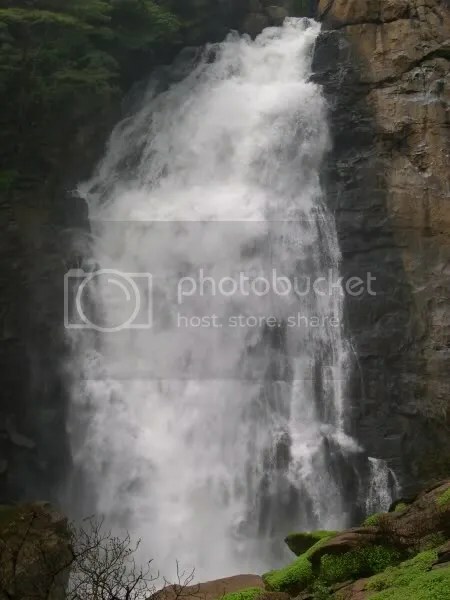 It would be a sight to see it filled to its brim. 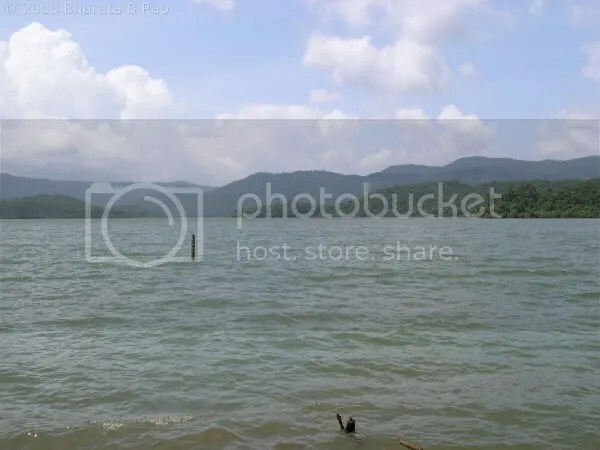 On one side of the lake is the village and on the other side is the forest area followed by a hill. 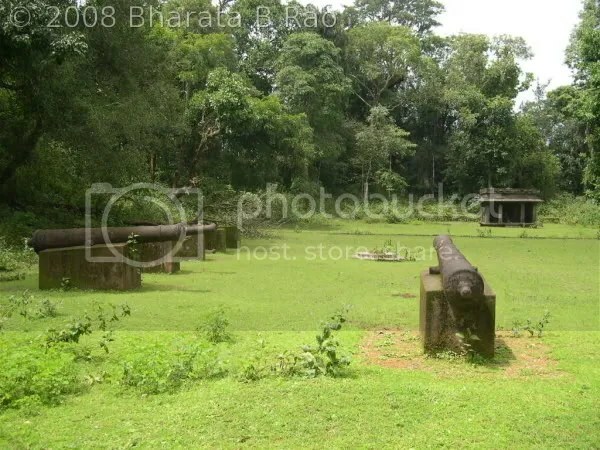 The village is connected to the forest via a well built tank bund. So our first leg of the trek involved crossing the tank bund. Munimadayya mentioned that the cultivated fields in the village frequently attract elephants from the Bannerghatta side. 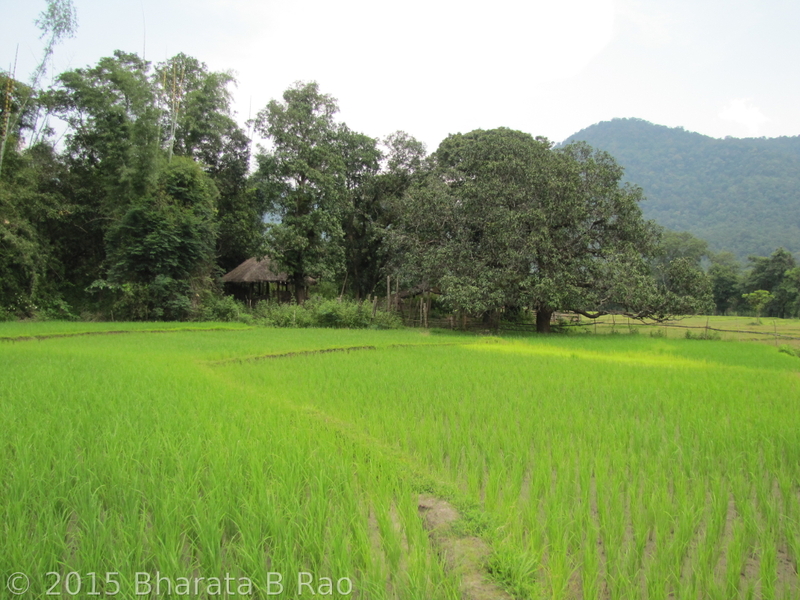 He even showed a paddy field which had been grazed to ground by elephants recently. So with an increased hope to spot elephants, we slowly entered the forests. For the starters, we were greeted by a herd of spotted deer. The forest was mainly bushy type without any long trees. 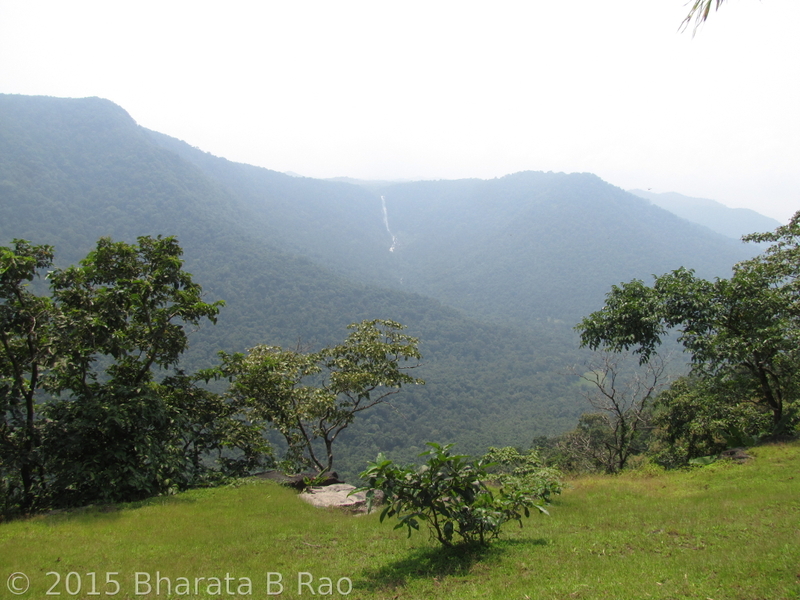 After a 45min walk and a mild climb we finally reached the Muninagara Cave or the Siddharagavi. Our head lights were soon out and we entered the cave. 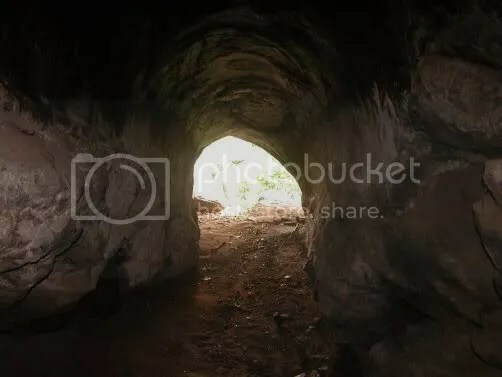 The entrance takes us forward for around 10m after which there is a fork and the right fork seems to lead into the interiors of the cave. But we couldn’t get past this fork as there were too many bats. And being disturbed by our headlights, they were almost flying into our heads. We spent a few minutes there with the hope that we could get the bats to the other side so that we could explore the cave a bit more. But the bats stood their ground and we had to retreat. From then on, we did an uphill walk for an hour to reach the top of the hill. This hill is like a mini table mountain with a large flat surface in the top. 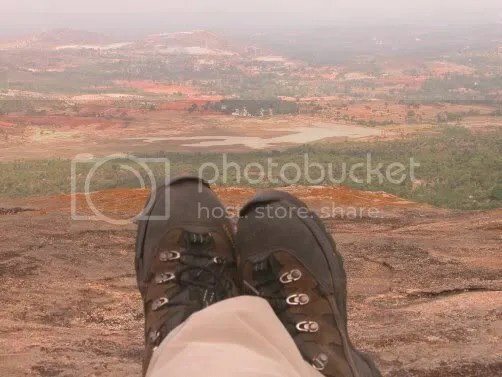 Entire Bannerghatta range is visible from this hill top. 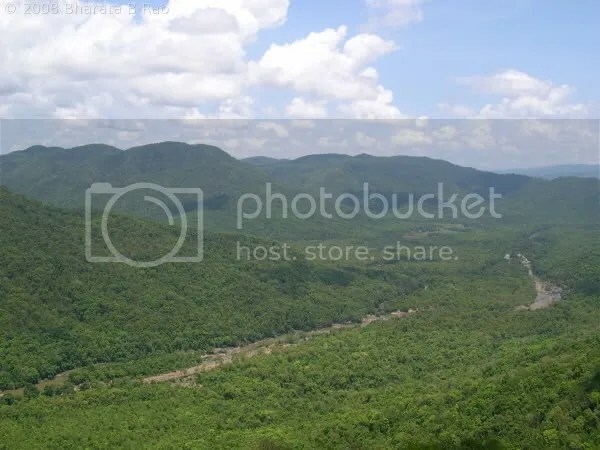 This hill is part of Bannerghatta National Park and here we were in the National Park without anybody knowing our presence! The place looked like an ideal camping ground for a night. But there is no water available in the top, which can be a problem. Apart from that one should be careful as this is an elephant territory. More than that, I think it is not advisable to spend a night in the Park without permission. After spending some time at the top, we started the descent. Munimadayya took us down from a different route. The next place to visit was the Karadigavi or Bear’s Den which is around 2km from Muninagara situated close to a motorable road. It takes less than 50m of fairly steep ascent (with the last few meters on a rock face) to reach the Bear’s Den. Fortunately bears weren’t at home to welcome us. But there were all signs(like bear’s pug marks and fresh excreta) to show that this home was occupied. And I still think it would be a dangerous proposition to find a bear welcoming you when you have just completed a steep ascent and gasping for breath. The only escape route is to slide down the steep rock face and hope for the best ! So the bottom line is accompany a guide and allow him to reach the cave first. This almost turned out to be my shoes’ last photograph! 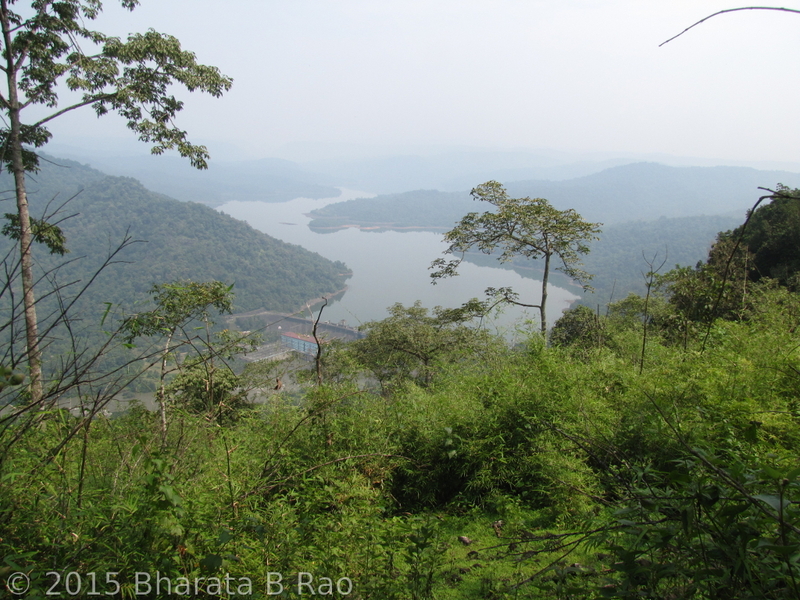 We continued our ride on Kanakapura Road for a few kilometers and took a left diversion into Kumbalagod Main Road. A few kilometers further into this road is the Swanandashrama which boasts a 21st Century Hoysala style temple ! 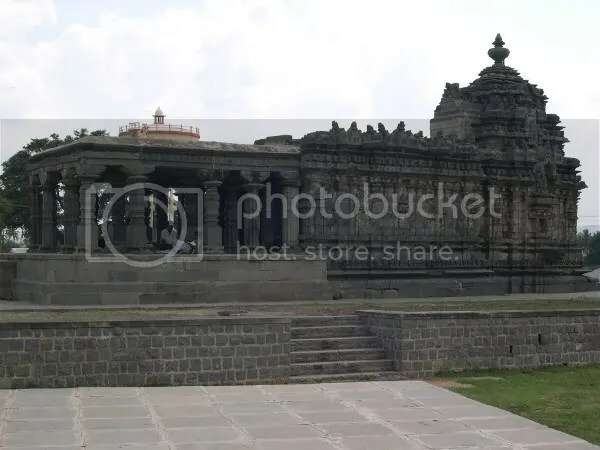 Yes, you read it right, a small temple has been built here in Hoysala style and this is the first time anybody has attempted this amazing feat in 750 years ! 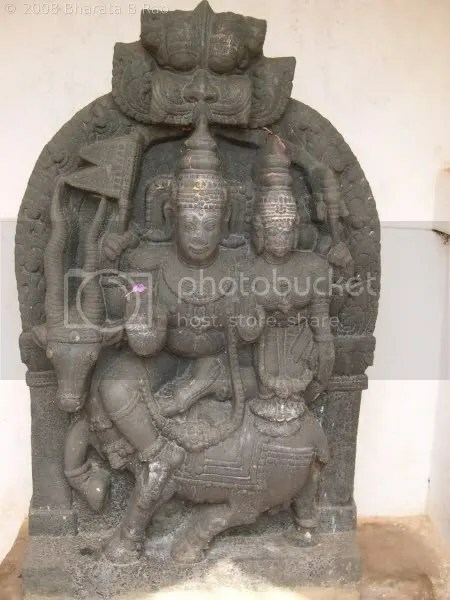 The sources say that this work took almost 4 years, thanks to the sculptors Suralu Venkataramana Bhat and his wife of Kadamba Shilpa Shale, Bangalore and his group of 12 sculptors. The temple needed 45 tonnes of soapstone in total. 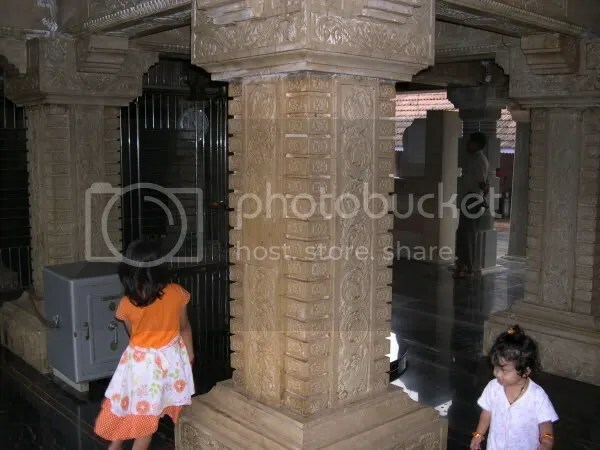 This is a must visit place for anybody interested in Indian temple architecture. 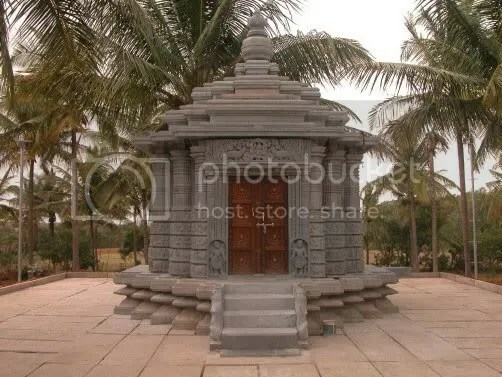 It was interesting to see how different a soapstone temple looks when it is just built. 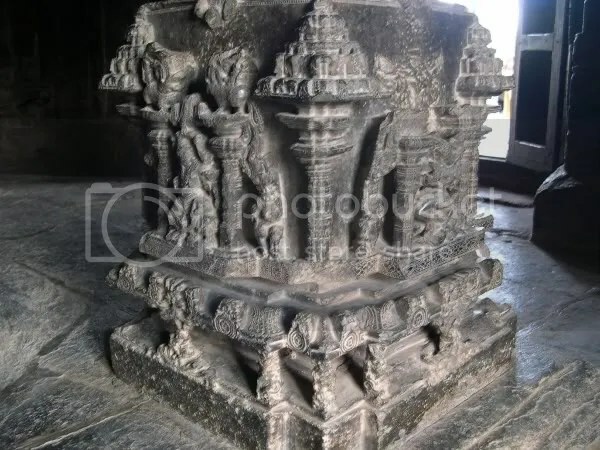 Till now we had only seen the old seasoned temples built of soapstone in places like Belur. We were forced to spend a few extra minutes in the temple by the rain after which time we proceeded towards Bangalore. All photos are courtesy of Naren. You are currently browsing the archives for the Temples category.